After a disappointing summer of wind and mediocre sunshine we decided to take a chance on the weather and go camping! Hey-on-Wye is a place we have been to a few times because it has so much to offer for a few days break. 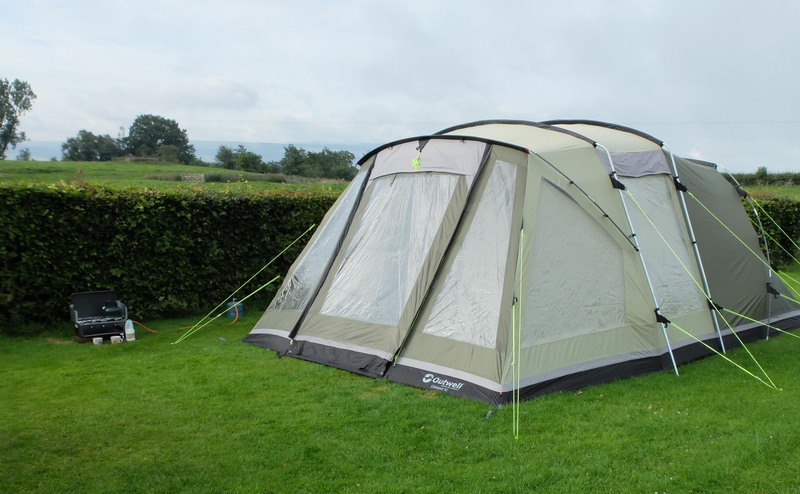 The campsite is small and quiet, with a toilet and shower block and no entertainment but for the pleasure of being there. When I say camping it’s more like ‘glamping’, the teapot comes as does a tablecloth and a vase for some hedgerow flowers! It really is fun and very comfortable on our kingsize airbed snuggled beneath our quilt. 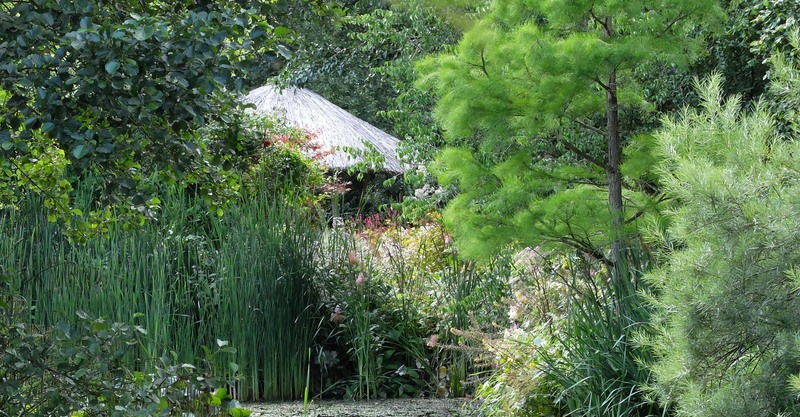 But despite having some wonderful food at our tent it’s nice to go out and visit some of the local coffee shops and indulge in lunch at the amazing Water gardens at Pembridge. It’s thanks to a very helpful lady at the Old Chapel Gallery just a mile from here that we went for lunch, and very good it was too. This place is hidden away down a track, so easily missed. But there is so much more to see here than this exceptional cafe because it is just the prelude to one of the most beautiful gardens I have ever seen, and all created from the imagination of one man. 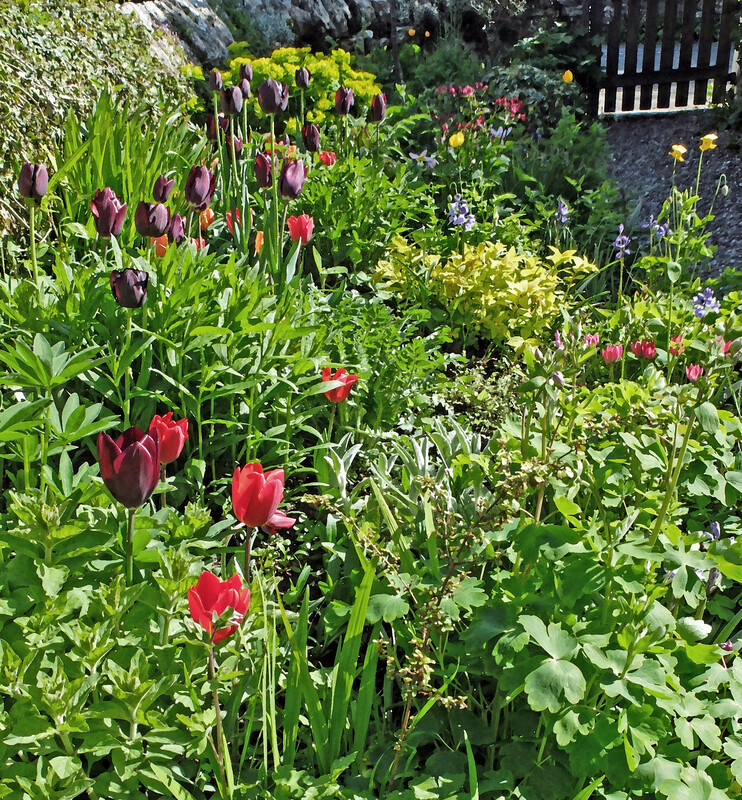 The garden has been nurtured and developed by a Hydro Geo Engineer, and holds many fascinating constructions incorporated into about half of it’s 3 1/2 acres. Upon entering the garden just left of the cafe one gets a first glance of what’s to come. 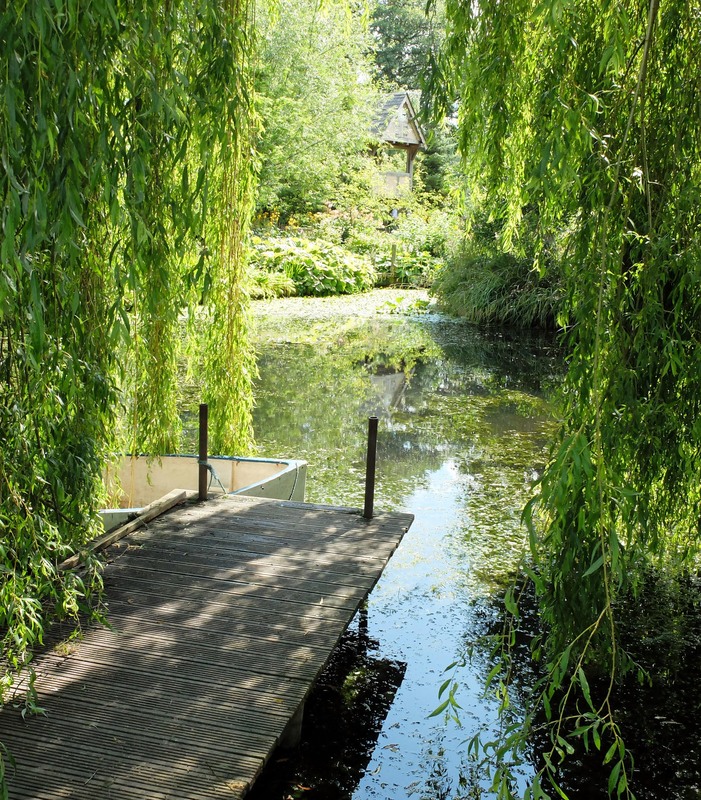 When going over a small bridge, the home of the owner of this enchanting place greets you. 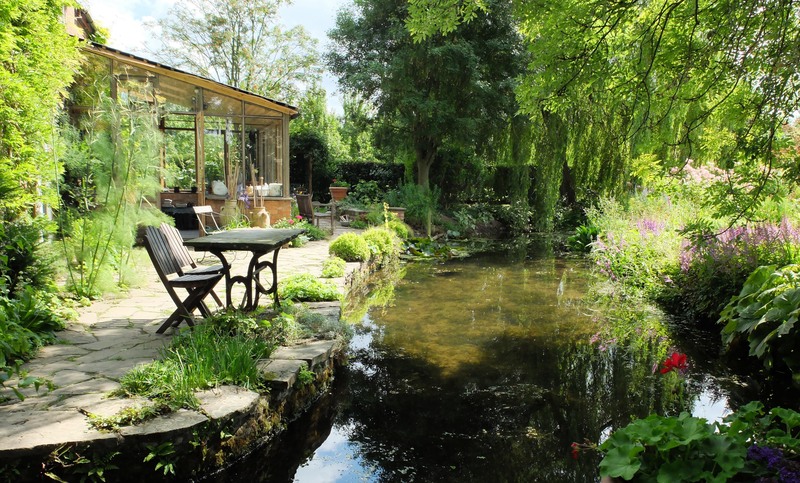 A slow running stream meanders past their patio, somewhere I could envisage myself sitting on summer days. 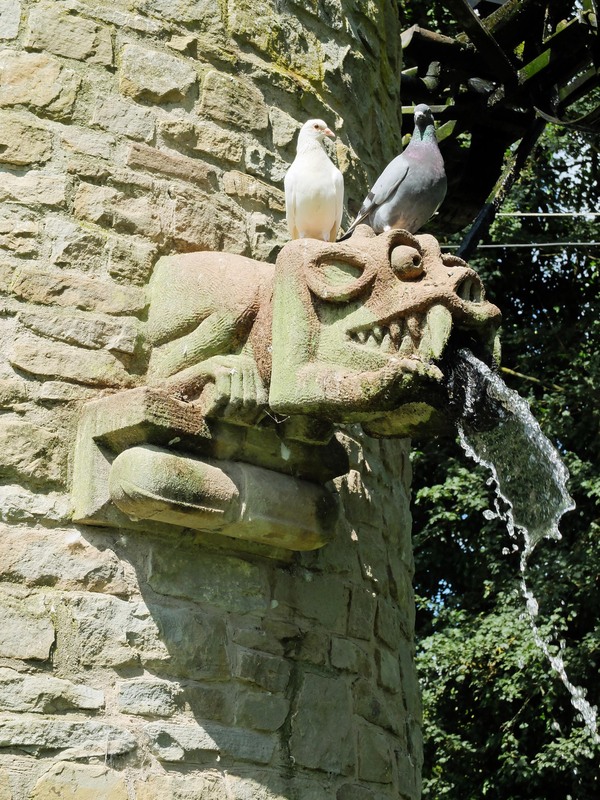 Then into the garden, where a dovecote tower stands with gargoyles spurting water from their mouths. 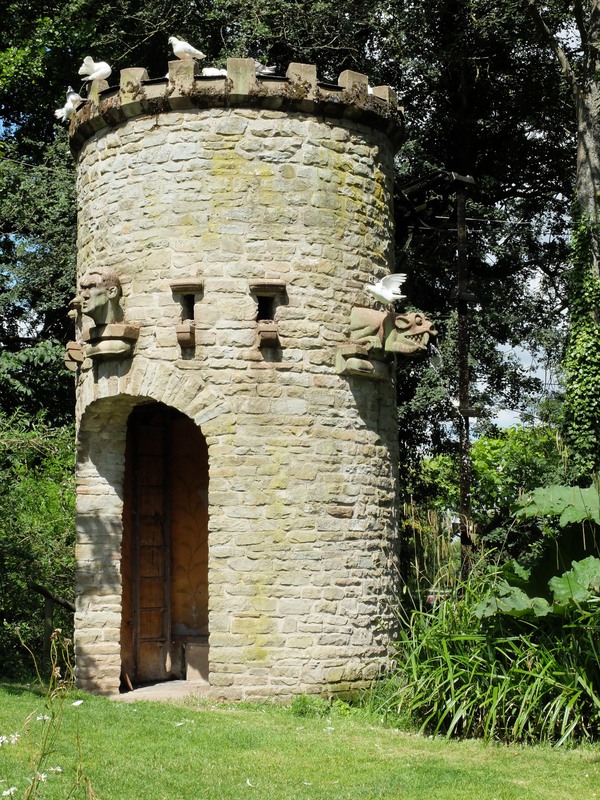 Richard Pim the designer of this folly and the garden is truly talented and skilled. 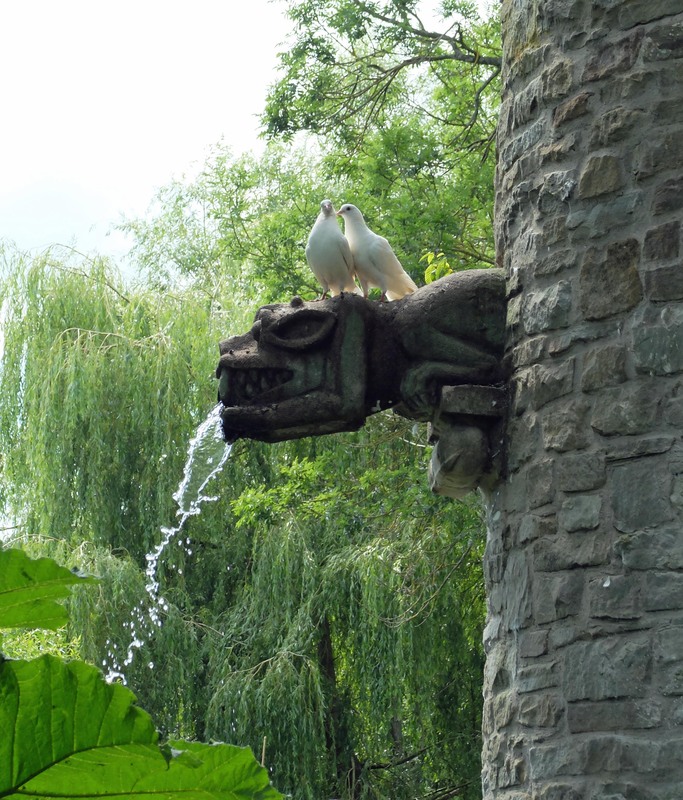 He carved the stone heads and gargoyles himself and provided a unique home for doves. 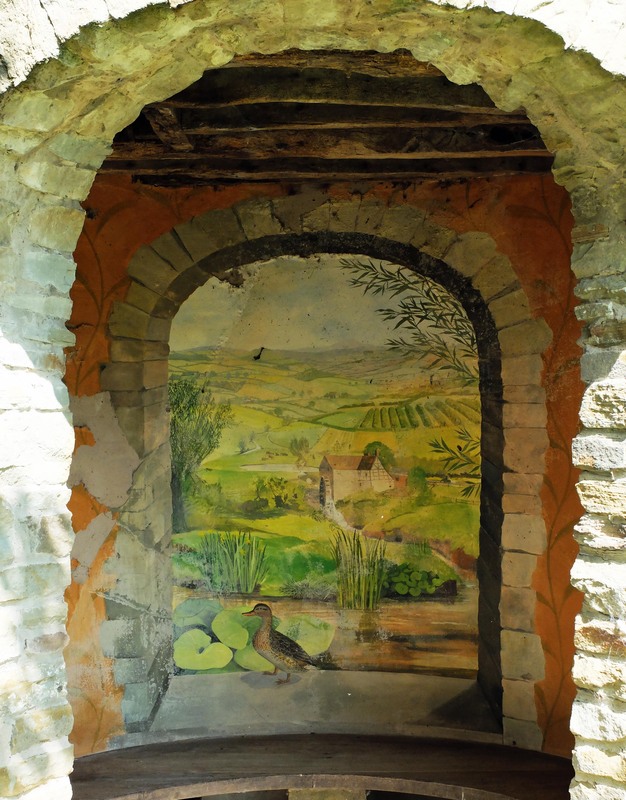 You can sit inside the tower where a fresco painting adorns the walls, such attention to detail! Moving on from the folly there are vividly colourful moisture-loving plants everywhere you look. 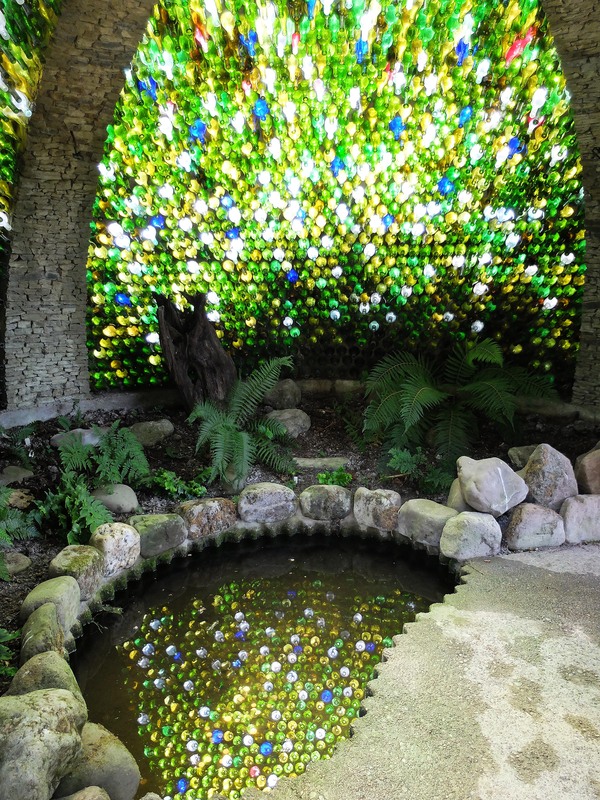 Walking through and around a tangle of streams and ponds, partly shaded by a backdrop of mature trees, there is a dome built from glass bottles. Kevin McCloud would love this place! Light streams through this dome like colourful jewels casting gem like strands of beauty around this circular building . There is a pool which cleverly reflexes more light. Standing on the jetty you get your first glimpse of the largest cuckoo clock in the country! A folly of true excentric proportions and technical ambition. 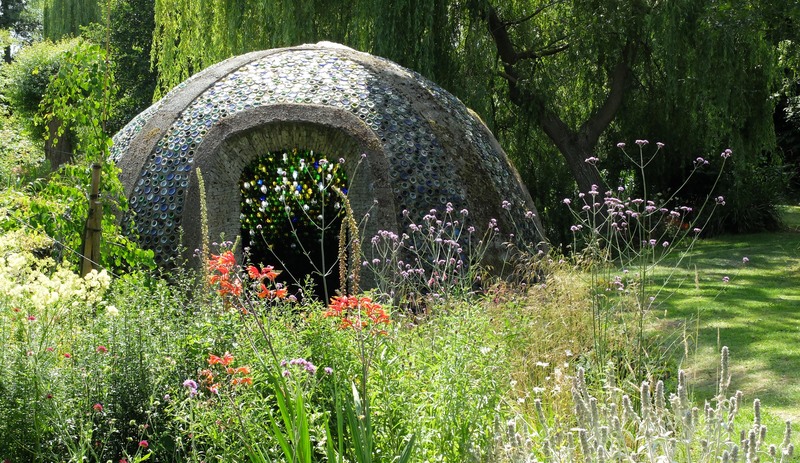 It’s creator is a talented man with an imagination for some quirky buildings surrounded by an outstanding selection of plants. We sat and waited till 4 o’clock until the cuckoo sang, and as it did we watched the incredible mechanism responsible, wood and metal singing out her tune. 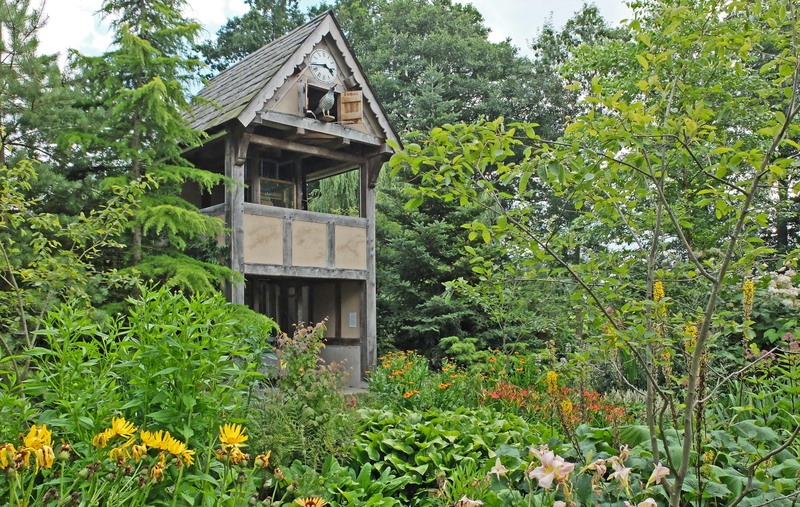 It’s wonderful that there are still people out there prepared to build such wonderful fantasies for us to enjoy as in the gardens of old estates. 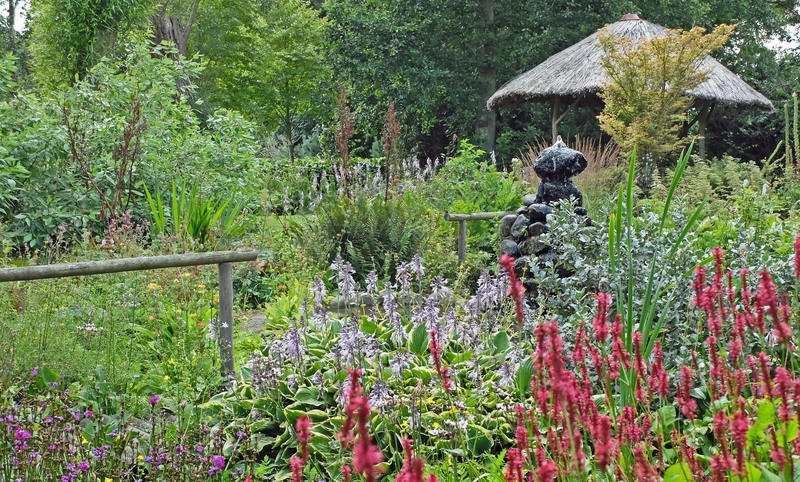 Theres so much to see in this relatively small garden, and each surprise greets you from ingenious planting schemes as you follow paths leading you to each delight. 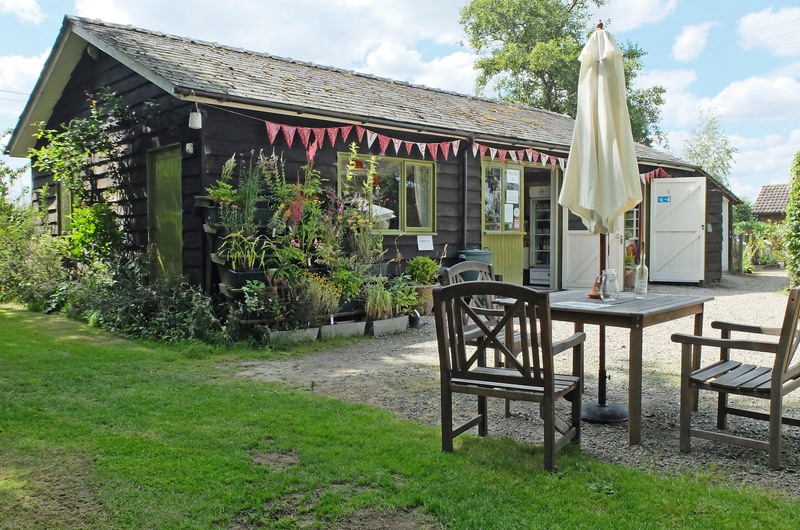 The hut appears towards the top of the garden just before the wild flower meadow, offering views of the neighbouring farmland and distant hills. 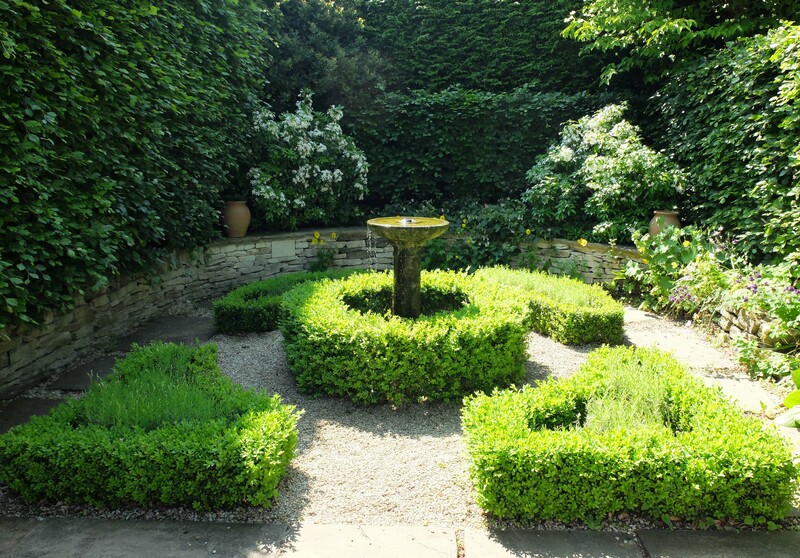 This garden is playful and fun, but there is no doubting the skill involved in its creation and the sheer delight on the visitors faces is proof of its success. As we made our way back to the cafe, there, parked up as if from another time, was an old car, so fitting in this setting. Sorry I don’t know what the car was, couldn’t find a name on it! 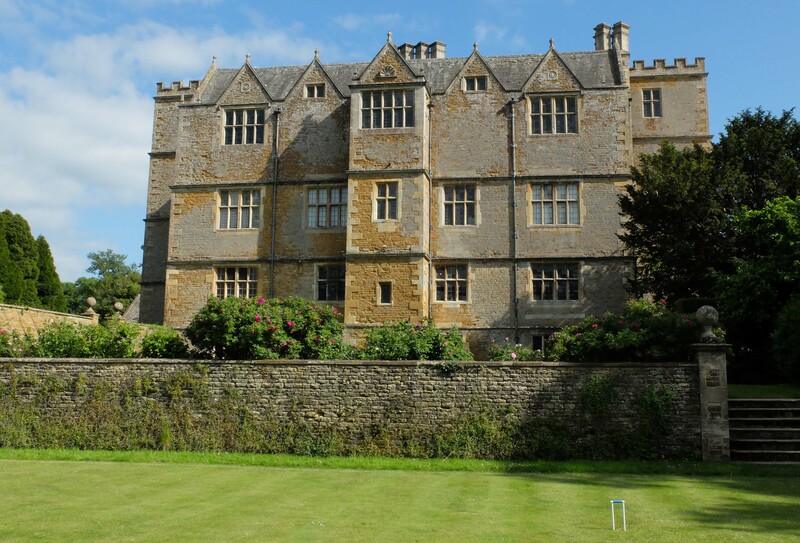 Whilst in the Cotswolds we visited Chastleton House a beautiful Jacobean country house and garden built between 1607 and 1612 by the son of a prosperous wool merchant. 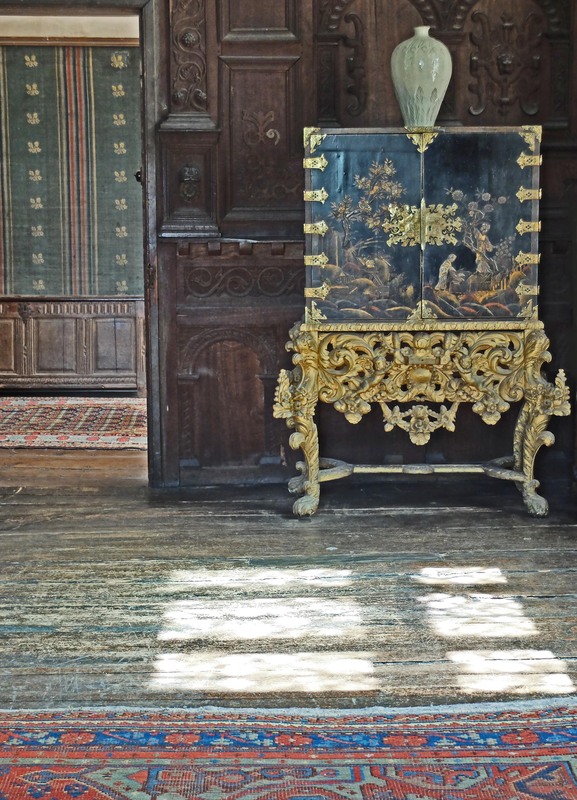 It was owned by the same increasingly impoverished family until 1991 and it has remained essentially unchanged for over 400 years. 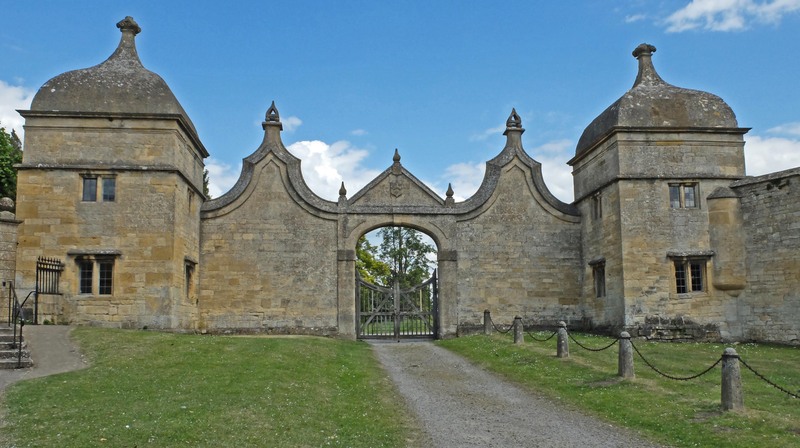 The house is quite beautiful in its calm and comfortable acquaintance with the landscape, not ostentatious or grandiose, but settled as if intending to stay until the ravages of time return the stone to the earth. 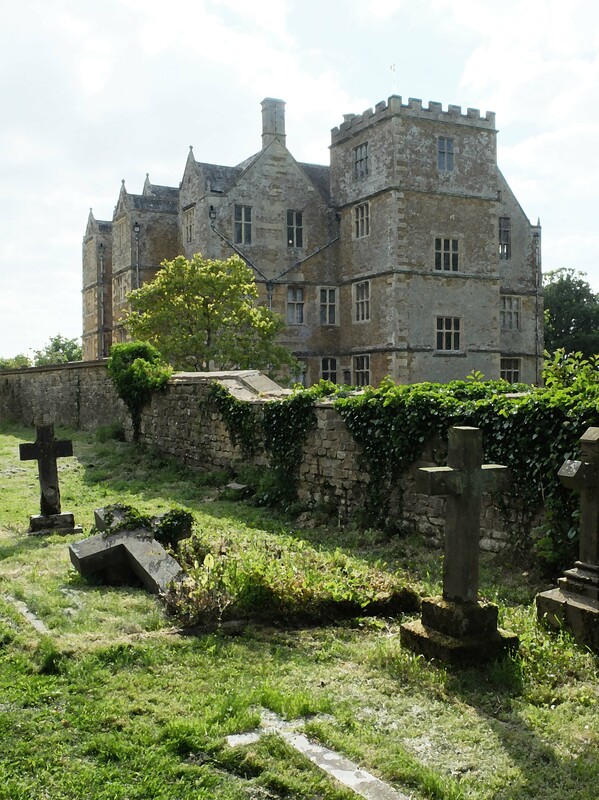 Unlike so many National Trust properties, Chastleton is authentic, leaving you with a sense of reality of the lives of the characters who lived there. Everything seems normal here, everyday people from the past who had just slipped out leaving their clutter and dust behind them. I’m glad the Trust decided to leave the house intact, they just sorted out any structural damage but thought better of shipping in fancy artifacts. Everything here is collected by the previous owners over 400 years and what wasn’t sold in times of poverty has stayed, junk and all. 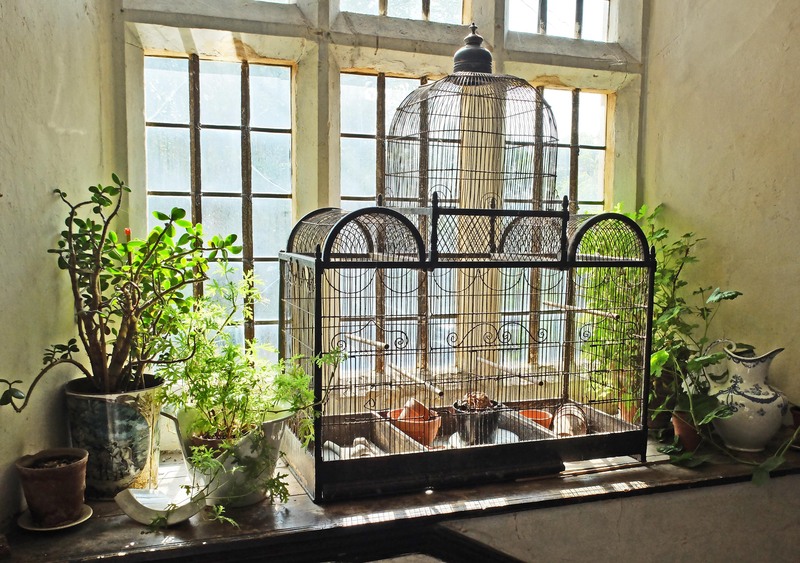 There are items I would love, like this amazing bird-cage surrounded in an array of plants! 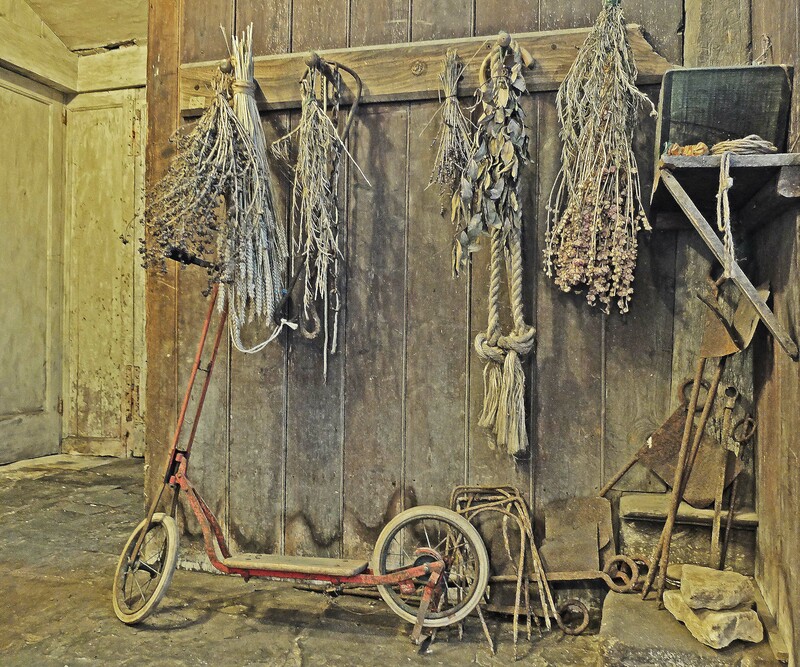 Or this red scooter resting on the peeling paint in the hallway next to a collection of rope and bric-a-brac. 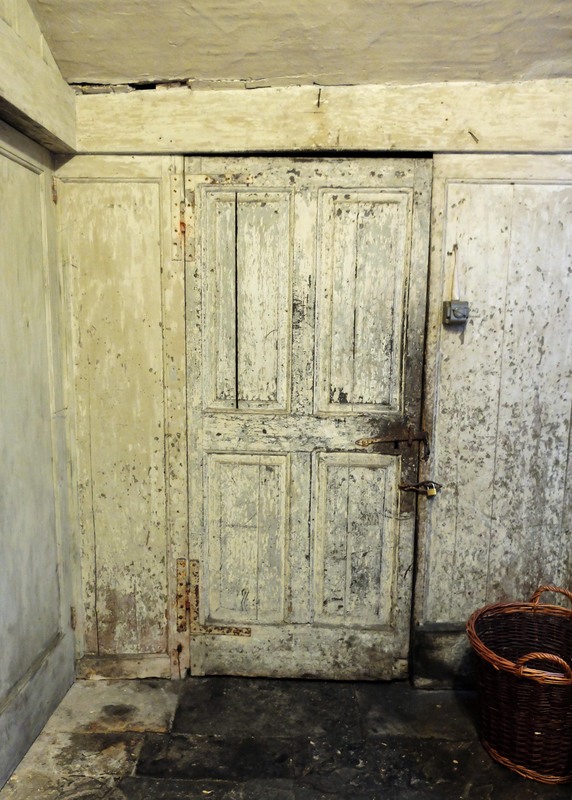 If you love peeling paint this is the place for you! 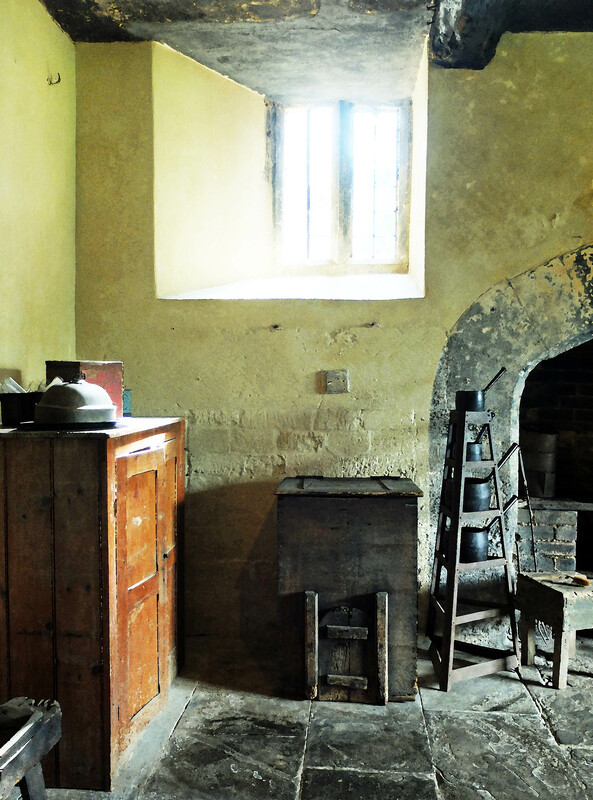 The kitchen is basic, not grand like many of our historic houses, but functional. 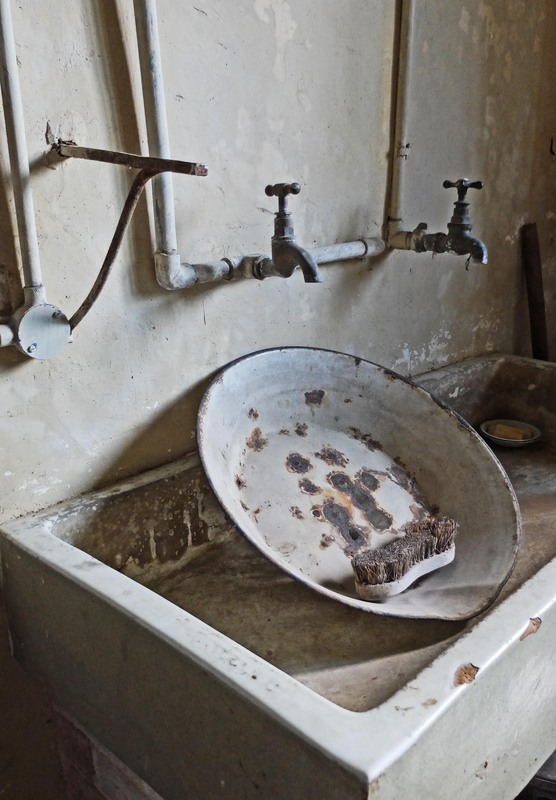 Even the sink has been left as it was found when the Trust took over. It’s easy to imagine people living here and how hard life must have been, no frills, just hard toil to keep the place going. It’s amazing it survived with such neglect, all items of value gone, just the ragged remains of your ancestors to comfort you through the cold winter nights. This place could so easily have been the house of Heathcliff in Wuthering Heights, be it in the wrong county! 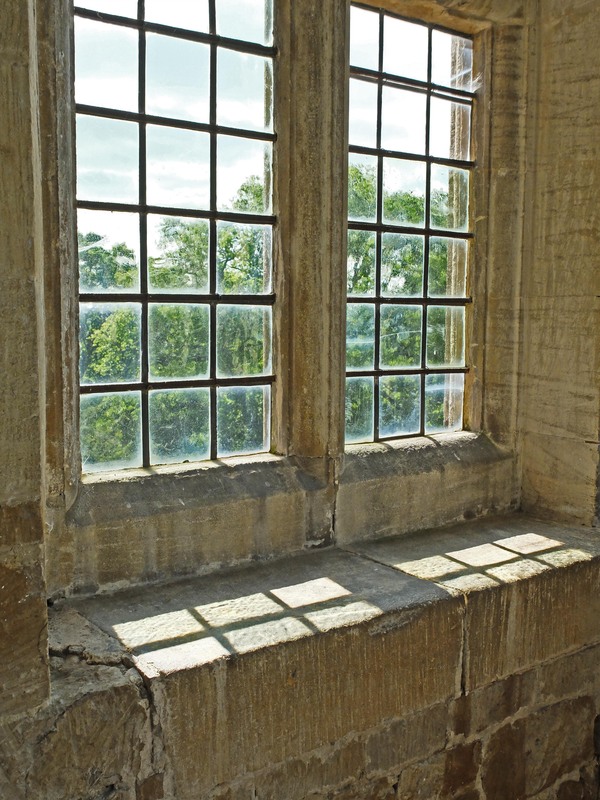 What really struck me was the quality of the light, the gently mellow shadows cast upon the Cotswold stone. Worn and aged, but somehow all the better for it. 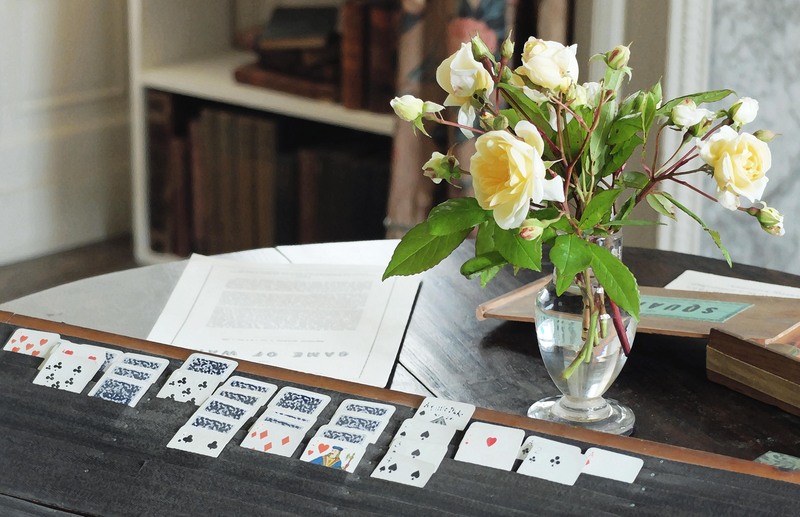 A card game, although set-up looked in keeping with the room. So many gems to capture your imagination, like a film set. 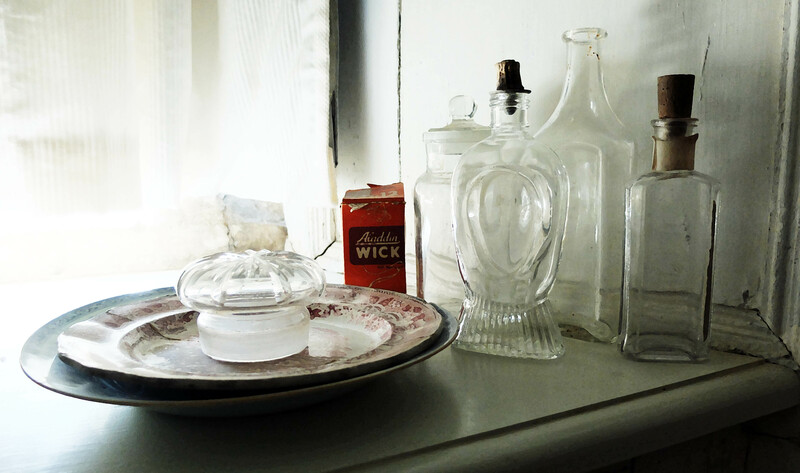 Everything in this house has the simplicity of the everyday. 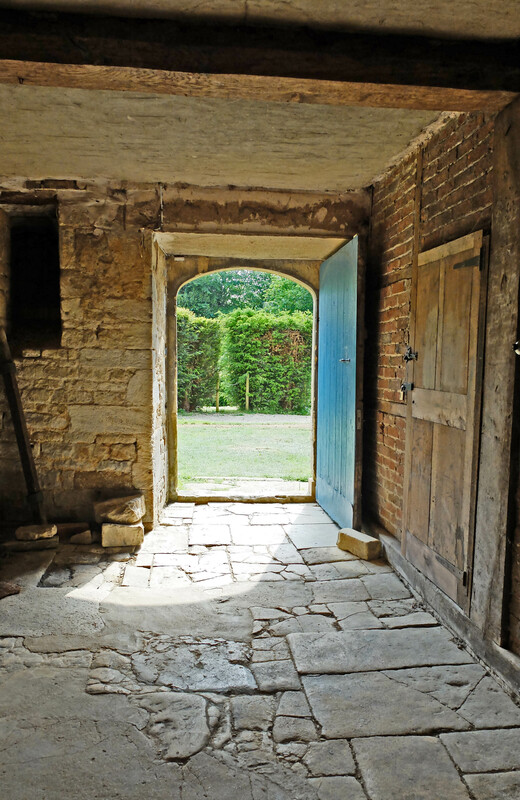 Entering the storerooms below the house just off the courtyard. 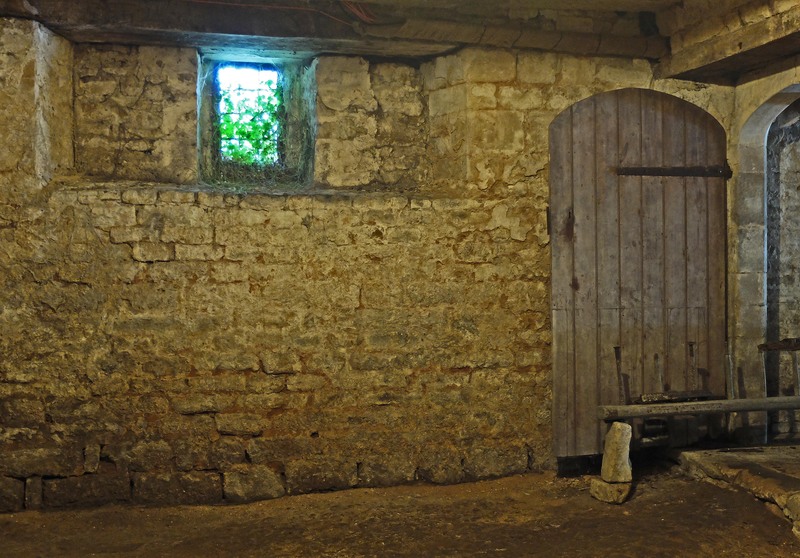 Cold and dark with an earth floor, the air damp, what went on in here I wonder? Time to leave this wonderful house. We stayed for some time soaking in the atmosphere, somehow you don’t want to leave. 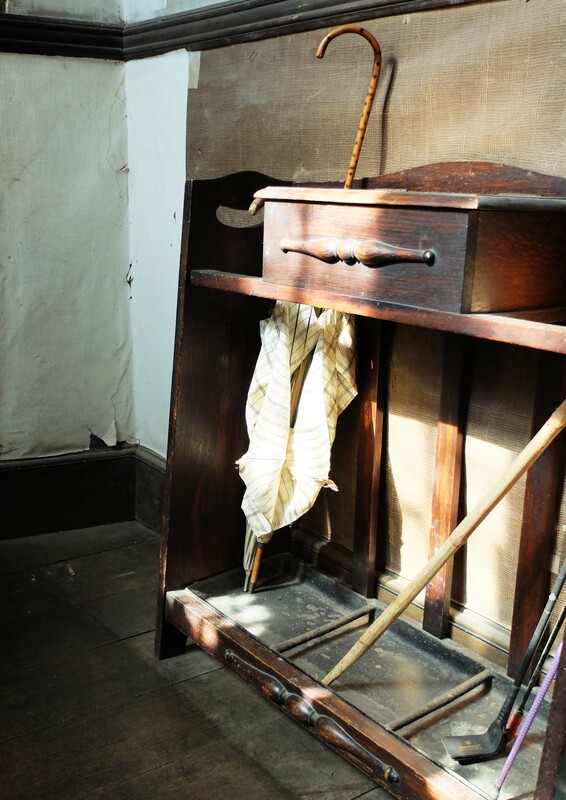 Although plain in its interior this house held more fascination than many of the great estates I have visited before, I could live here, with its charm, cobwebs and dust, just like a modern day Miss Haversham! After being distracted because unpredictable things happen in life, and some you can’t avoid, we decided a break was in order. 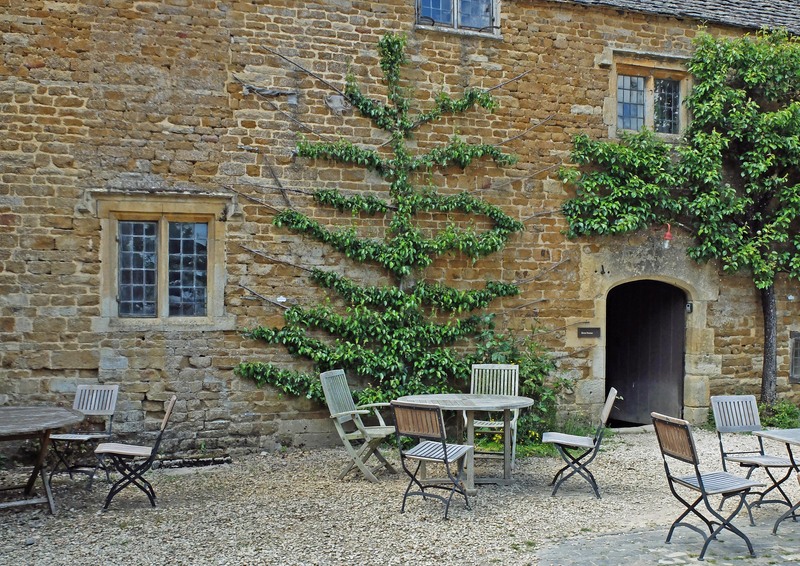 So we decided to take a trip to the Cotswolds for a rest and to escape the demands of everyday life. 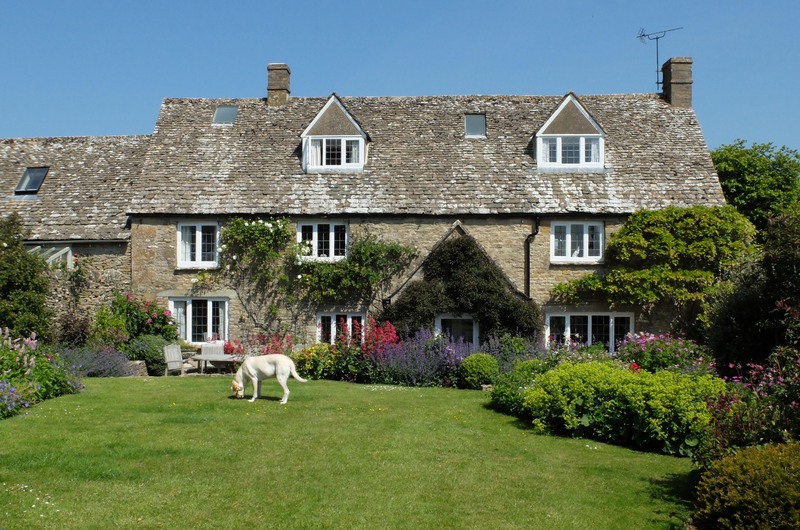 The beauty of living in Britain is the ease with which we can easily slip from one style of architecture and landscape to another in a relatively short distance. The colour of buildings very much dictates the county one is in and the whether hills or dale each one has its identity. We were looking for softness and a gentile escape and as a visitor we found it. I’m sure if you have ever trolled the internet for a Bed & Breakfast you will have found it a nightmare! Each possibility is considered with trepidation and fear of getting it wrong! Afterall this is not a cheap option in the UK, therefore it has to be right. 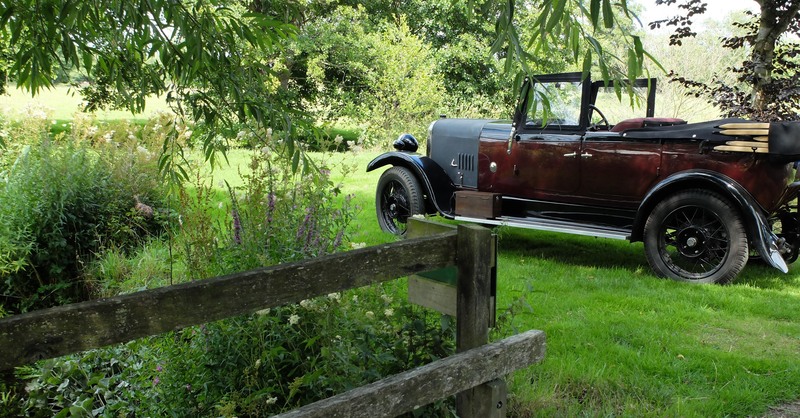 But we got it right, or should I say Alistair Sawday, the oracle of wonderful places to stay did! This is our second venture into Alistairs world of exquisite place to lay your head and we were not disappointed. 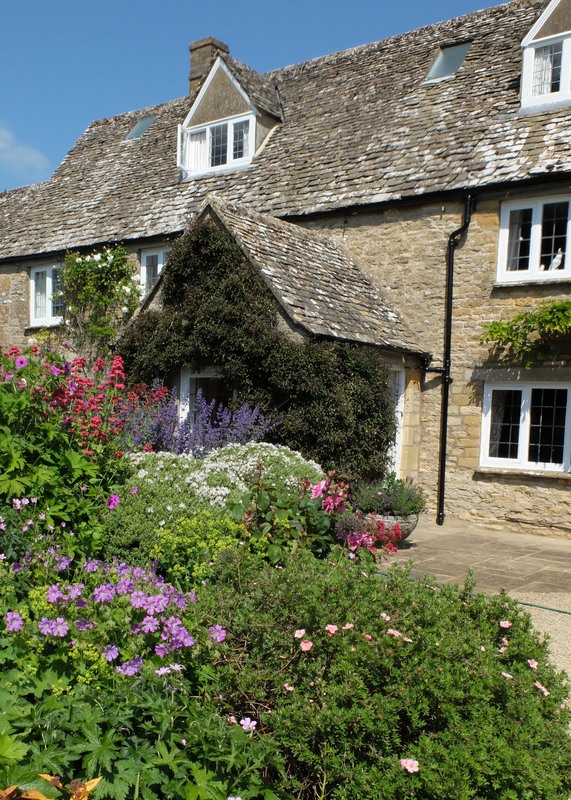 Wren House is in Donnington just outside of Stow-on-the-Wold and is a little piece of tranquil heaven. As soon as you arrive a calm falls upon you and it’s time to relax. There was nothing to complain about here, everything was perfect, the house, the decor, the wonderful bed and gardens to die for, and the breakfast…..I could go on! 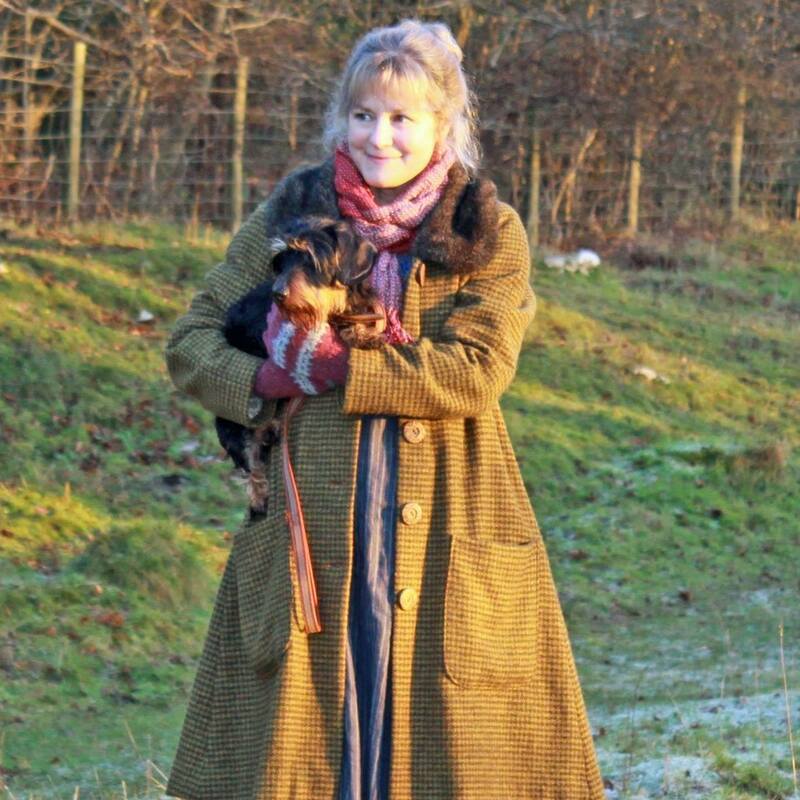 Kiloran, our lovely hostess, has just the right amount of helpfulness, but respects your privacy, but is also interesting to chat to, and if you love dogs there are two beautiful friendly labradors, Gigha and Ailsa to welcome you. After breakfast on our first morning we decided to go to Oxford to visit the Pitt Rivers museum. Oxford is known mainly for its architecture, and rightly so, for this City has an essence like no other I have visited in Britain. Perhaps it’s because it is dominated by the abundance of academic buildings – Colleges, all intermingled with the business of everyday life. Black gowns flowing from the students walking or cycling through the streets, all eager to get to where they need to be. It’s easy to see how one could be captivated by such a place in all its gentle grandeur. 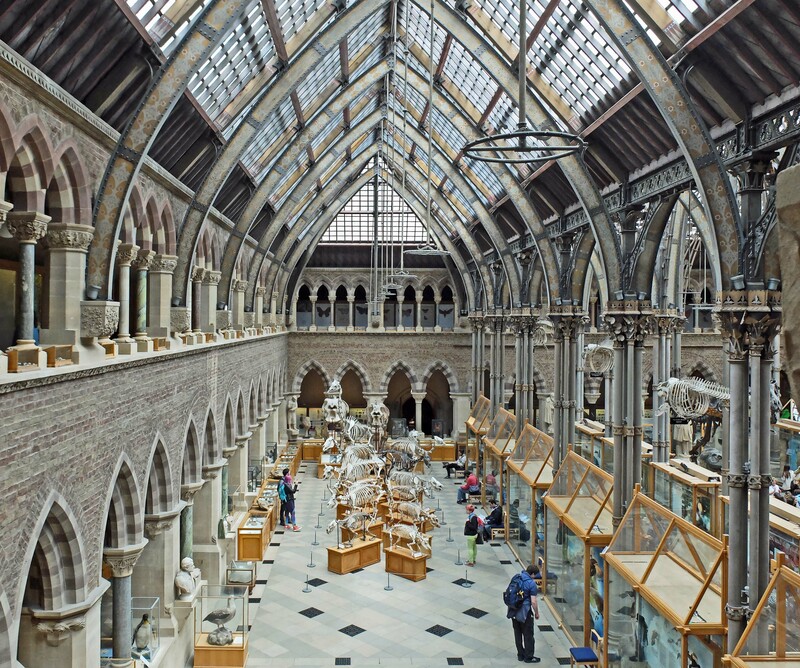 We have been to Oxford before to see the magnificent display of snakes head frittilarys (flowers) at Magdalin College but this time we wanted to see the Pitt Rivers Museum. It has interested me for some time because it is like no other Museum I have been to. Sometimes Museums can be a bit boring but this one is a gem crammed full of curiosities. First of all you are struck by the design and structure of the building, the vast pillars of steel and wood offering the visitor different levels to view the oddities contained within. 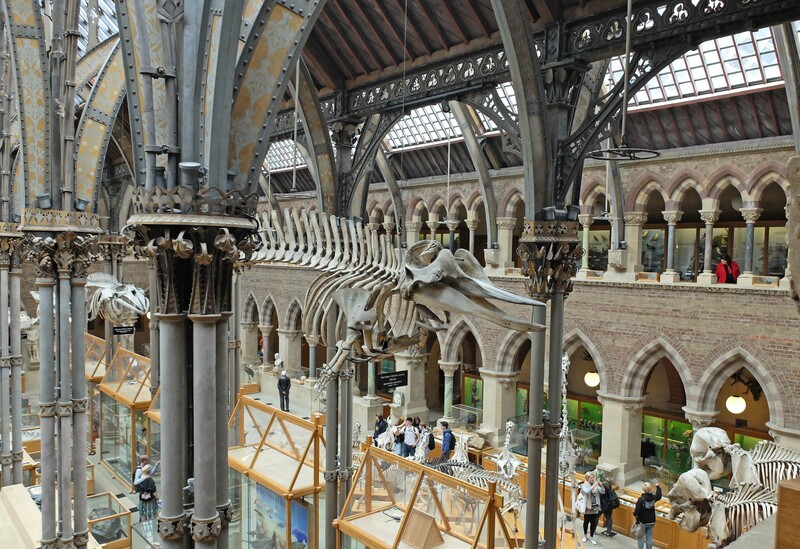 On the second level the skeletons of prehistoric beasts hang as if in flight from the roof of the building. The sheer size of some of these mammals is breath-taking and there are so many I have never seen or heard of before! If all museums had this much imagination they would always be full! We spent sometime looking around the area you can see above, the earth sciences section, un-aware that there was so much more a few steps down at the back of this picture. Upon entering the semi darkness which is in contrast to the bright space above, the enormity of the lower part of the building came as a complete surprise. It is crammed with fascinating anthropological curiosities on three levels, the second two looking down to ground level. By now we were tired and did not spend as much time as we would have liked exploring each cabinet. My camera struggled with the light and its not advisable to use flash in such places, but my phone coped well, so pictures from this part of the museum are on my Instagram pages. I could never do the Pitt Rivers Museum justice, but if you ever have the opportunity to go I would recommend it, it is truly an experience not to be missed. After our long day in the City we headed of towards the park and ride bus but were taken by a restaurant called Nosebag, recommended by a lovely lady stood close by as we were looking at the menu. The meal was excellent, vegetarian lasagne and aubergine tagine, both with lots of interesting salad. Full and tired we set off home for a good nights sleep ready for another day of adventures. Our next day we decided on a more leisurely day and headed for the Village of Chippen Camden and took a walk around the church there. The gates were the most interesting and very grand, although the church also was large for a small town, though I suspect it has always been wealthy. 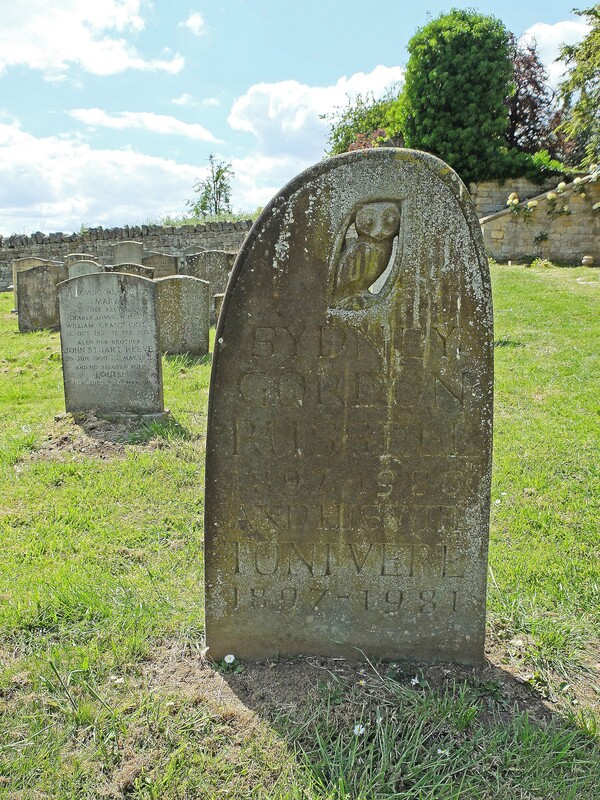 It was a pleasant walk, although the wind was keeping the warmth of the sun in check but we still walked around the grave yard and found a gravestone which I loved. The simplicity of design is beautiful and although old, seems so contemporary with the owl carved at the top on an off centre curve. 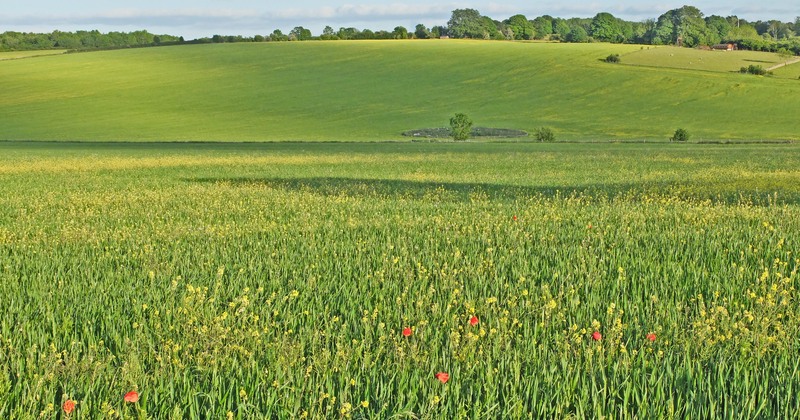 We drove through the countryside and saw fields full of poppies and rapeseed and as the sun came down the light was enchanting, like a scene from The Darling Buds of May! So many beautiful scenes around every corner! The evening was drawing in and it was time to go for a meal at one of the Inns Kiloran had recommended but not before Andy caught me windswept amongst the nettles whilst trying to catch the evening light, please forgive the hair! There’s so much to tell you, but for now it’s time for a cup of tea and a cuddle with Alfred……oh yes, and the man in my life! Painting and illustration has always been my passion but when I discovered paperclay a whole new world opened up to me. Portraiture is something I have always wanted to do but felt nervous about it because it is in my nature to want to achieve a good likeness and my attempts never seemed good enough. Paperclay offered me the opportunity to sculpt faces in a very different way to how I had worked before. It offers more freedom of creativity and thus giving me the chance to let my imagination roam and create a more surreal sculpture. 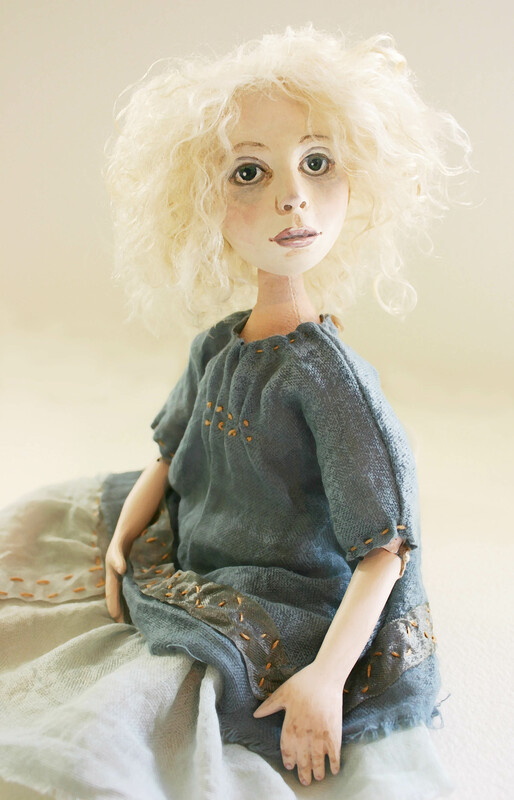 I wanted to make a doll that has expression, an ethereal look, neither a human or a doll. She is my first part clay part cloth articulated sculpture. Her head moves and has a cloth back and neck, so the face is almost like a mask. Her face is painted with watercolours and her expression is crucial to the character that emerges from the brush. The wrong shaped eyebrows or curve of eyes will easily spoil her expression, so this is the time you hope the phone doesn’t ring or you sneeze! Choosing her hair is fun and I get to play with different colours and textures. Fine mohair is the right scale for hair, but it takes a lot of work to make it look right, sometimes it is straight or crinkly. Her body is made from a tight weave vintage sheet, the type of which you can no longer buy, crisp but slightly textured, and a natural white which doesn’t glare at you like the over processed ones of today. The perfect surface to paint a tint of flesh colour on to match the painted clay body sculpts. 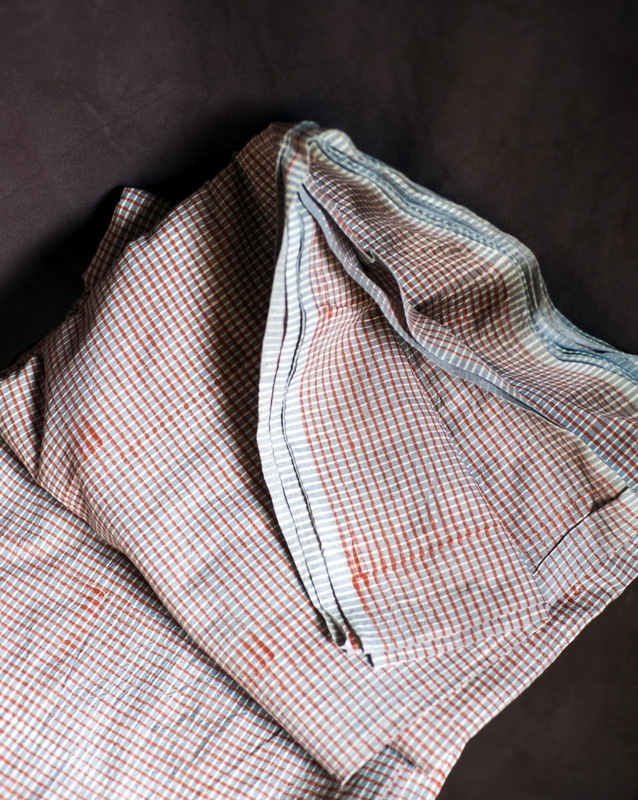 I decide to stick with the natural theme and joined the arms and legs with a fine waxed linen thread. I love this stuff and I’m pleased I have found a use for this lovely tactile thread! String is also a passion of mine and I am always buying natural or coloured string or threads in the hope I will find a use for it and I invariable do, I love the feel of it and it’s so useful! When I get to the clothes making and designing I can barley contain myself because this is where she starts to come alive. I can choose her personality right down to the shoes she wears. For this latest creation I decided the delicacy of muslin was the perfect weight for such a fragile creature. Shades of blue suited her perfectly, dyed by myself so the tones are the same but in different intensities. 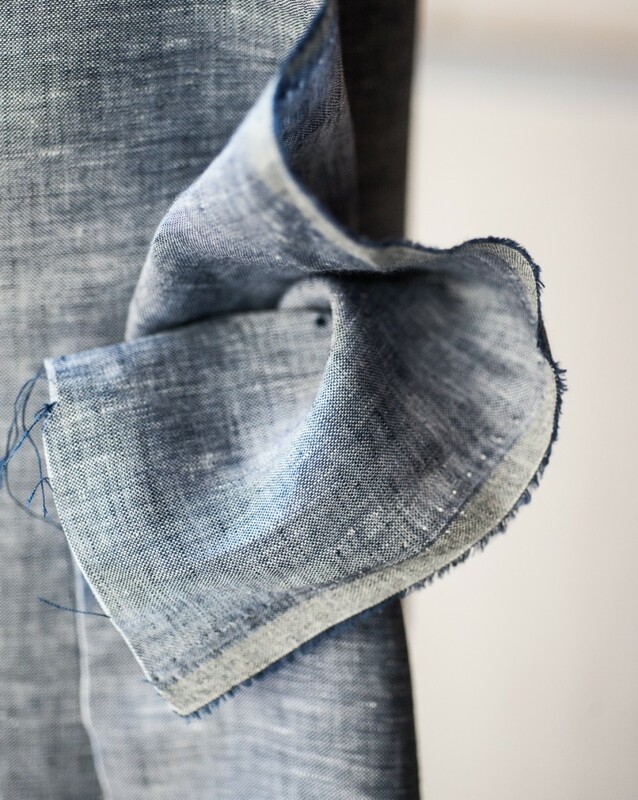 She wears bloomers and a dress with linen thread embroidery and hand dyed silk ribbon. For years I have collected small bits of leather and this pale pink soft leather is perfect for her slip on shoes. She has no name yet, but I have to live with her a while before I decide. Sometimes I don’t name them because it defines the character somehow, so I leave it up to whoever buys her as we all see different things in art. I recently painted one of my sculptures on brown paper in watercolour. 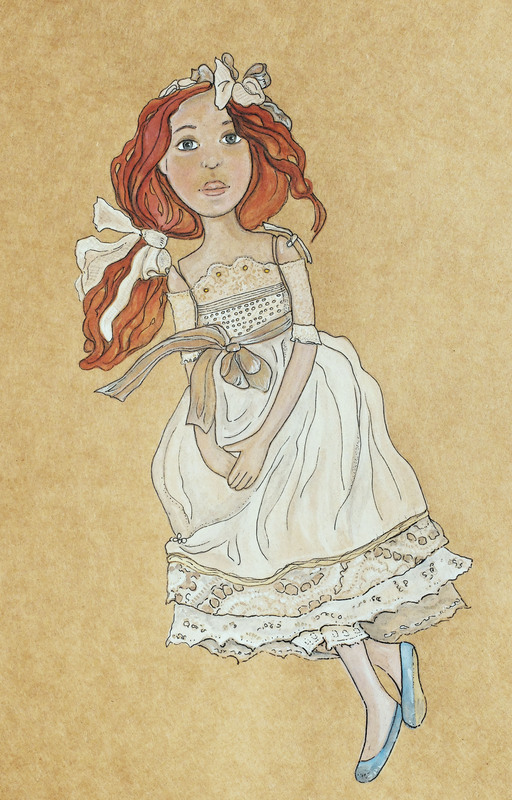 It’s strange painting a doll and lace is funny to paint, especially on brown paper! But she’s emerged very much like an illustration, no surprise there! It was fun to paint and I tried hard not to spend too much time on it but it’s so tempting to put in detail. 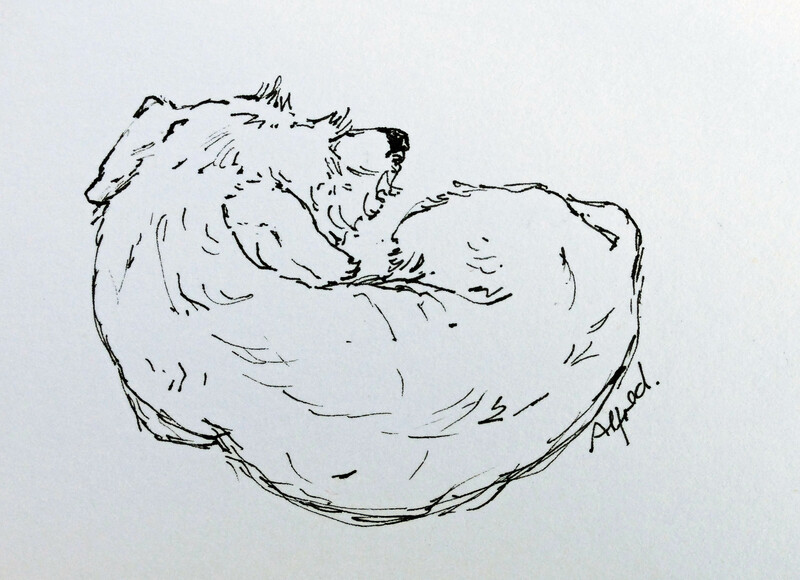 I struggle with loosening up which is why I have been doing quick sketches of Alfred! 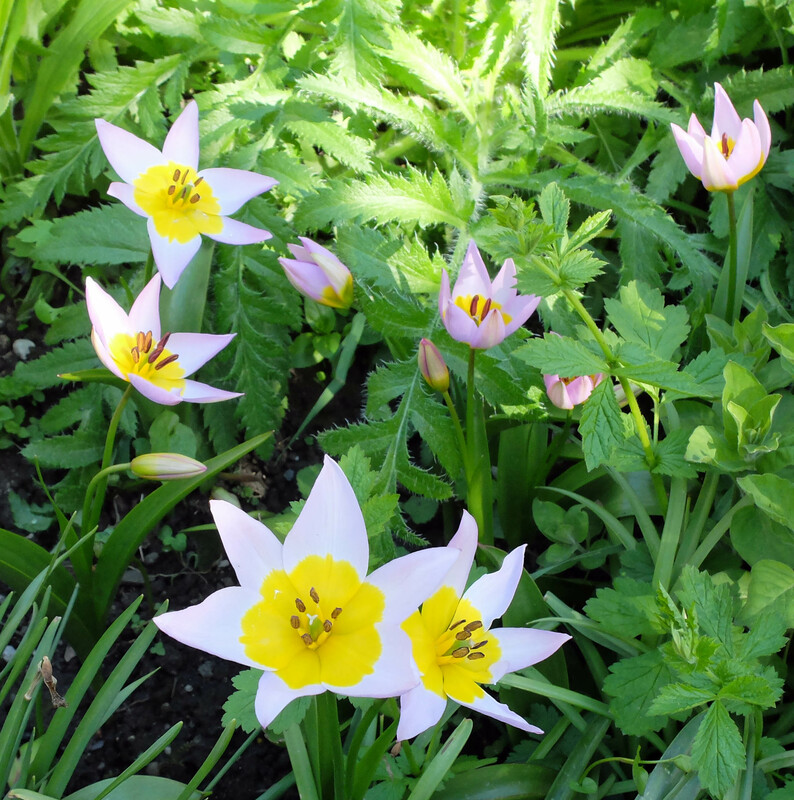 THE NOBLE TULIP AND THE JOYS OF BREAD MAKING! It seems like ages since I have written a blog post…and it is! You know how sometimes events overtake the plans you have in life, well the last 2 weeks have been one of those occasions. But I have been keen to share with you some of the more interesting snippets of the last fortnight. 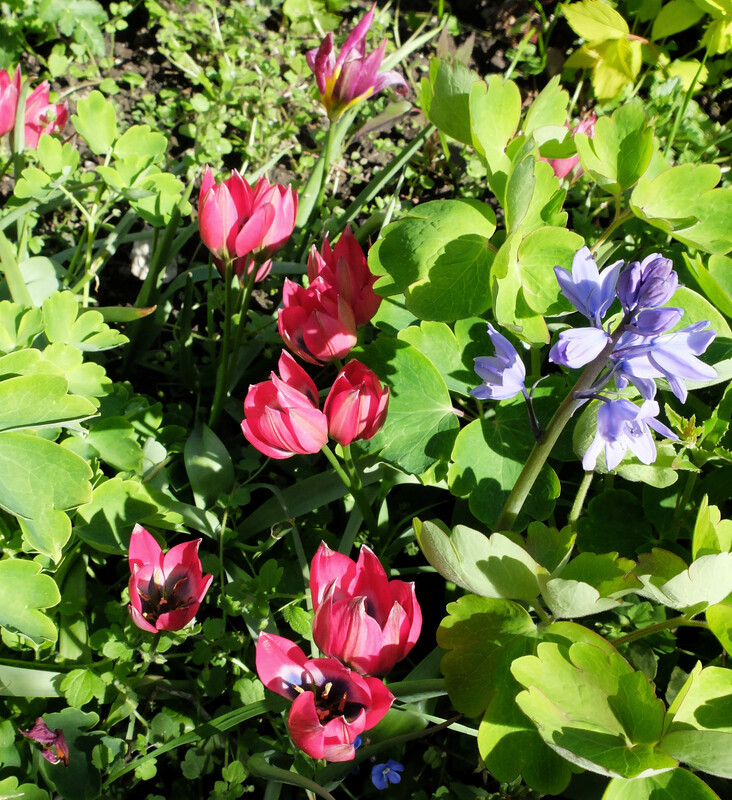 My garden is blooming in all its glory with spring flowers, particularly tulips. 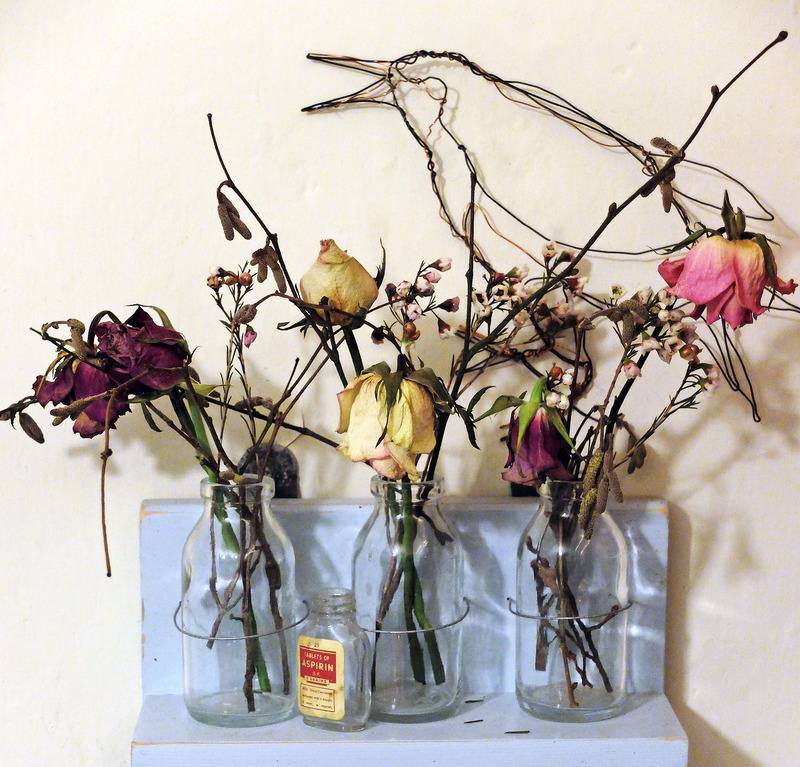 Now I have never been a fan of the noble tulip but was tempted by Sarah Ravens wonderful collections last year and and decided to give them a try. 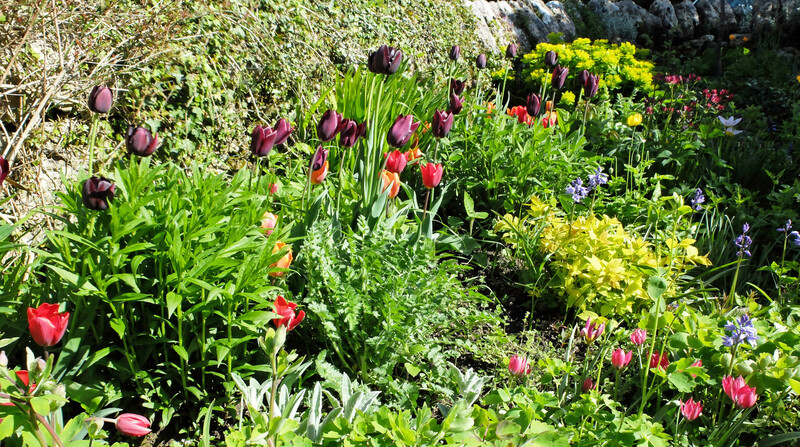 Our garden at the front of the house is only small so I chose varieties petite in stature. A wonderful orange tinged with a sage green, a deep but subtle red and a dark almost black beauty. The former has shot up larger than I expected and the orange shorter! I like the effect but may have to jiggle them round for next year as the orange needs to come forward in the bed. None the less, I’m very happy with the result. I would say, I rather love tulips now! About ten days ago I was invited to a mornings bread making at a wonderful spot called the Heron Corn Mill. 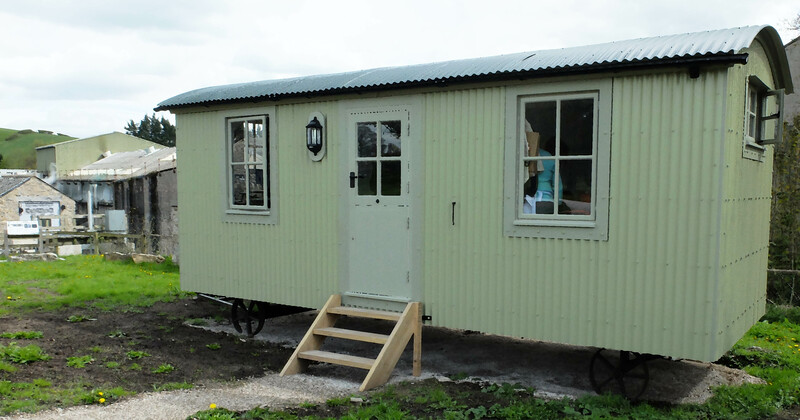 There is a Shepherds Hut on site specifically for the baking group which compliments the mills production of flours… such a sensible idea. 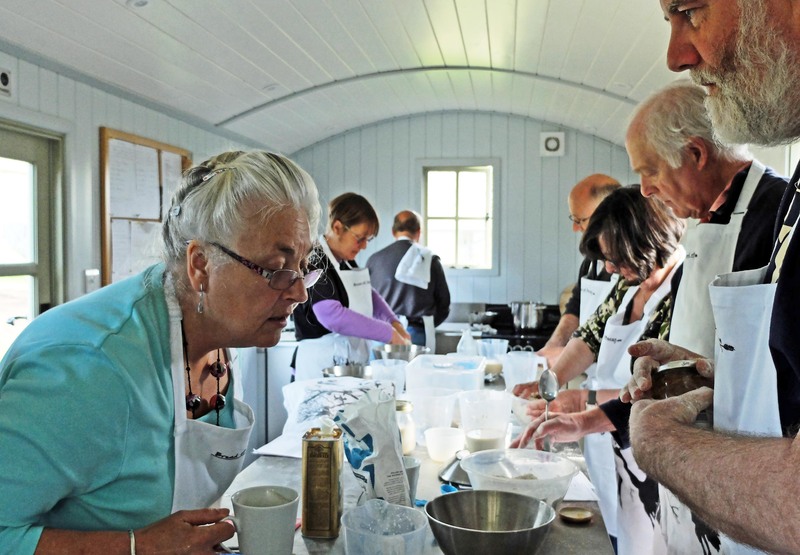 Once a month these lovely people get together to bake bread! What a joy, a morning taking in the delicious aromas in the company of enthusiasic friendly bread makers. It was heaven, an opportunity to pick up some tips on the humble art of making bread. 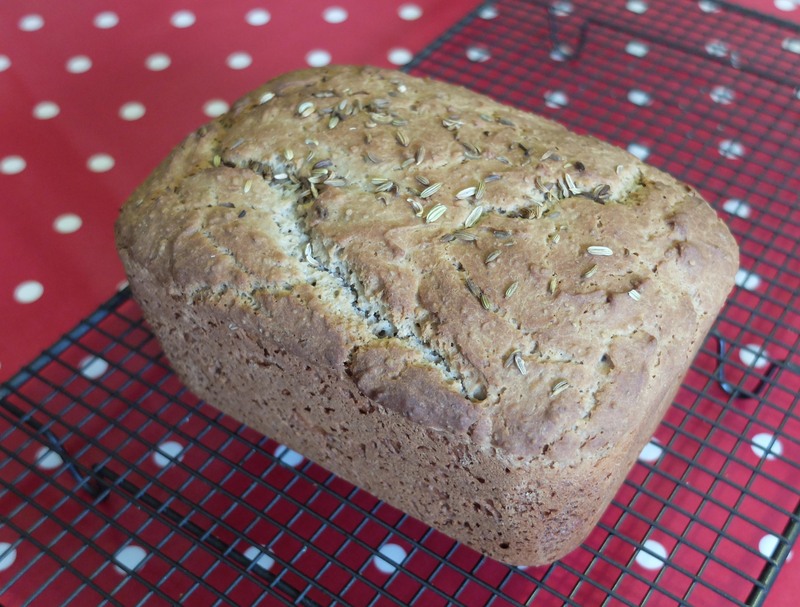 Although I have ‘dabbled’ in making bread my successes have been variable and more recently gluten free bread has been my obsession. 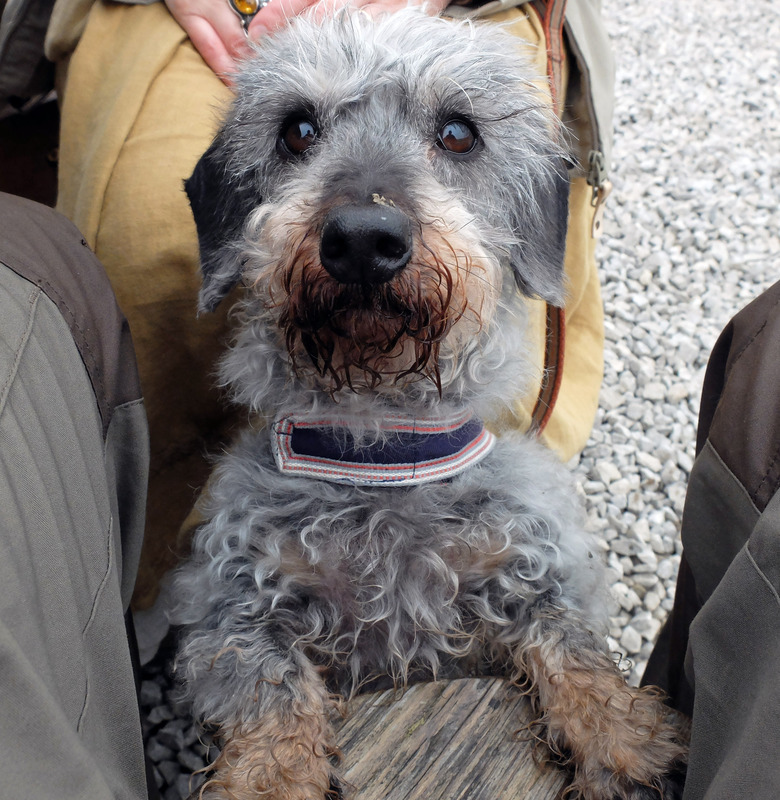 But I could not miss the chance for some good company whist needing, chatting and drinking cups of tea! 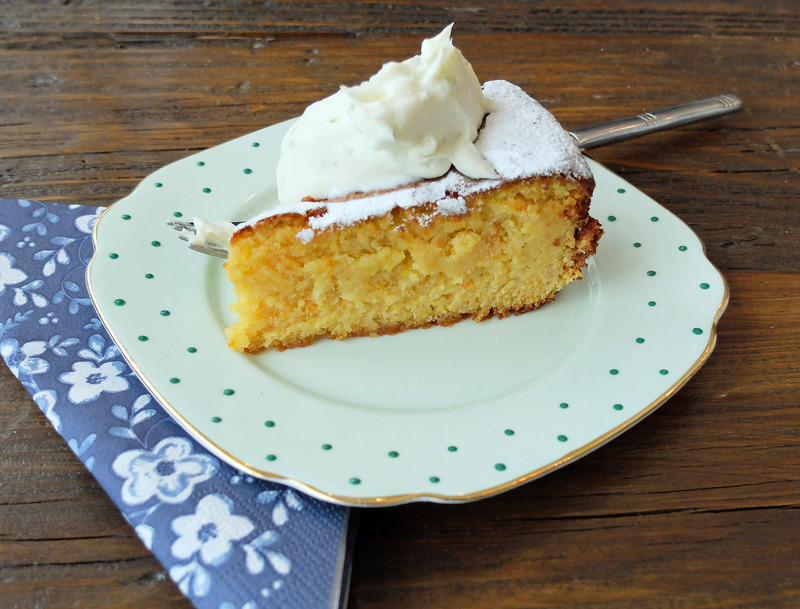 Shame we had to wait till we had baked something to eat – next time bake some cake before I go! 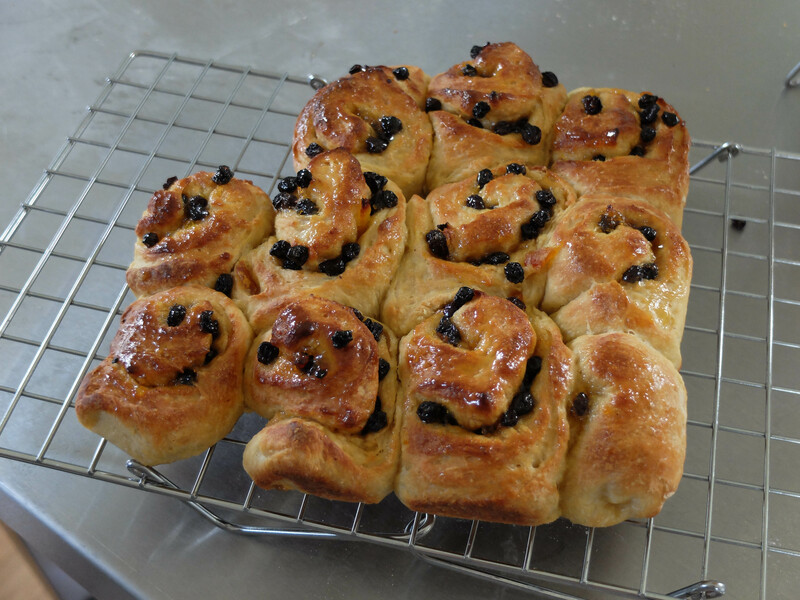 The whole process of bread making is time consuming so whilst waiting for our creations to rise we made chelsea buns, sticky and full of tasty little currents, I was in heaven…..
All the hard work was worth it and everyone produced a loaf worthy of plenty of butter and some homemade marmalade. I hope to go again, but I was a guest and the sessions are very popular, and I’m not surprised. 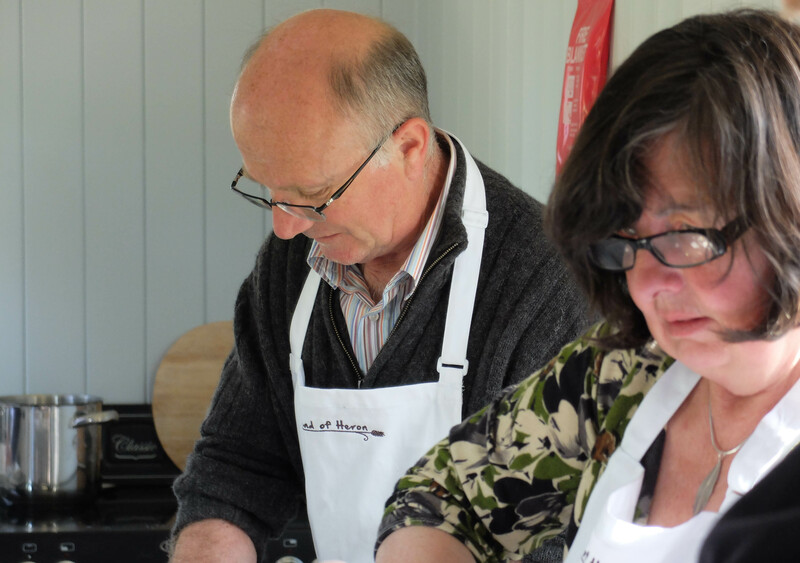 It would be amazing if there were more places like this to share bread making sessions, it’s relaxing and you produce something useful at the end, but most of all its fun! Enjoying the sun but not getting much work done! With the beautiful weather we have been having this last week I have been spending more time outdoors and neglecting my work. 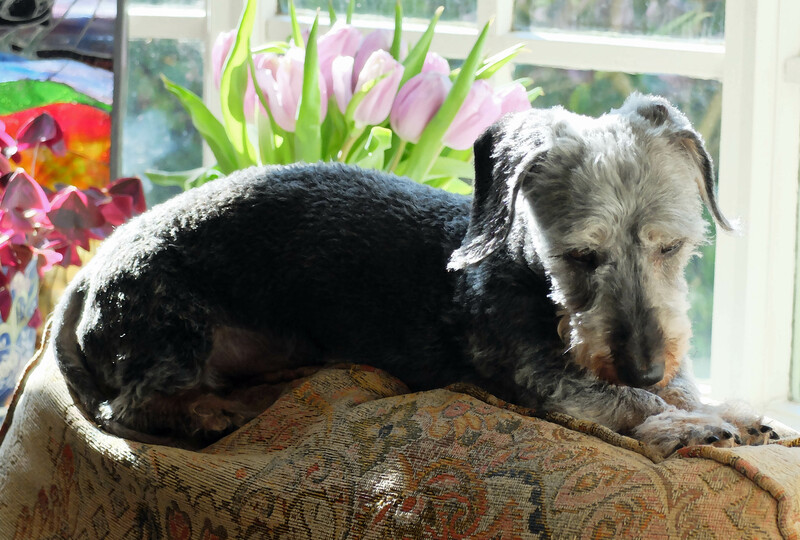 Alfred and I have been for many walks and the garden has been demanding my time. Far to nice to stay indoors! 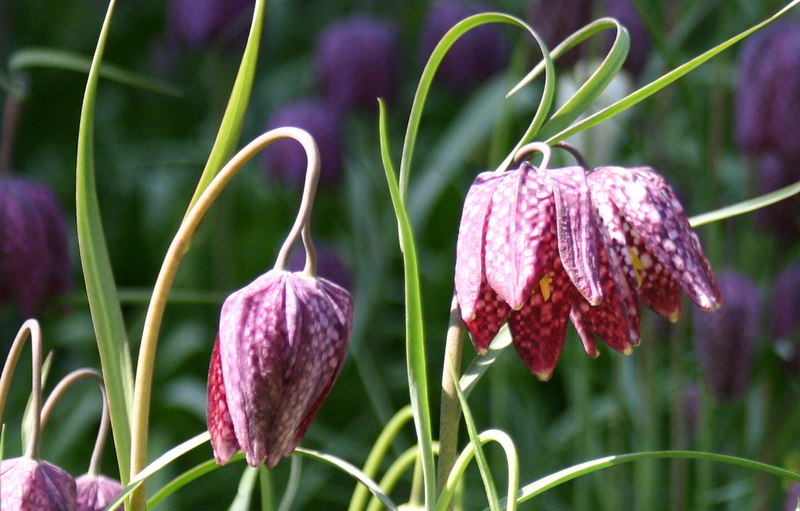 Spring is racing along, bringing with it a host of beautiful flowers. 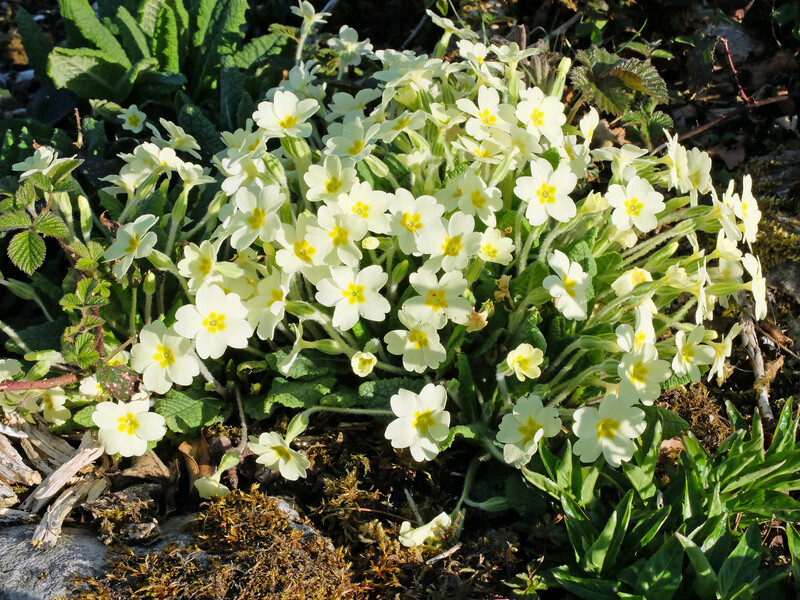 My flower-beds are filling up with Fritillaries, tulips, primroses and cowslips. 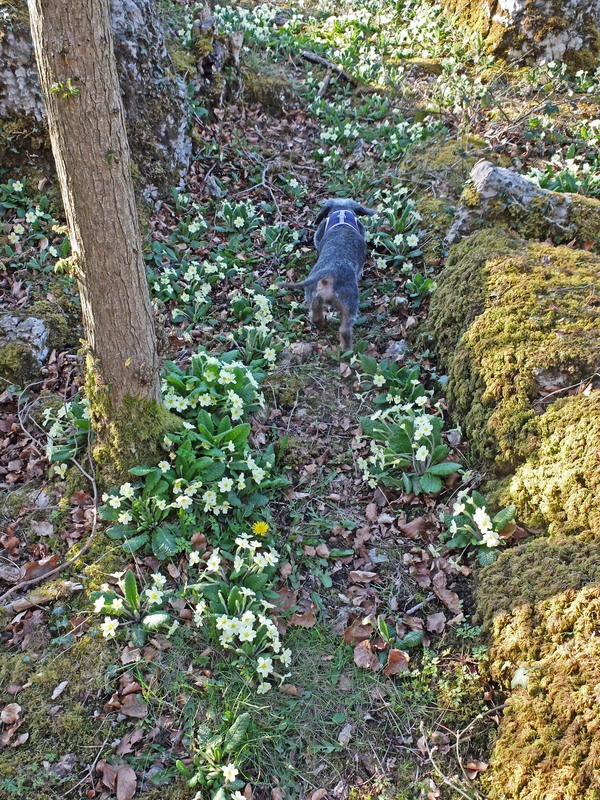 Our walks in the woods have been delightful and my favourite spot for primroses is at it’s best and Alfred loves to explore! Some of the clumps are enormous, far bigger than those in my garden. 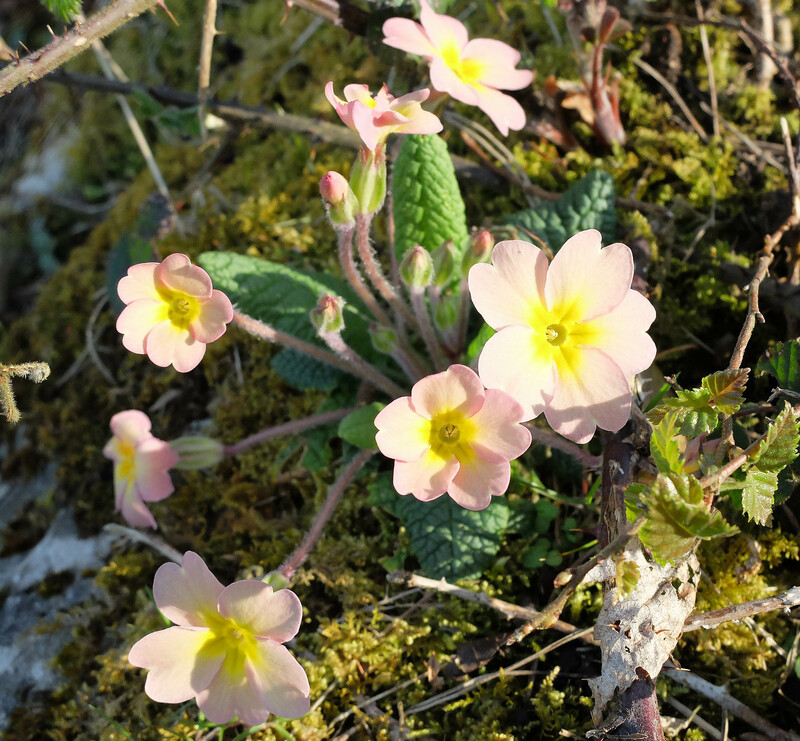 I even came across a pink one growing wild. 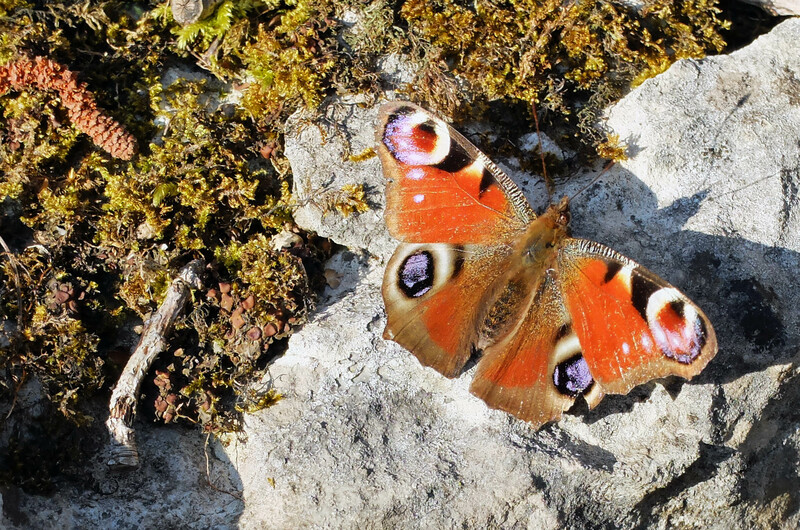 The evening sun was still offering some warmth for a peacock butterfly enjoying the last of the rays on a rock. 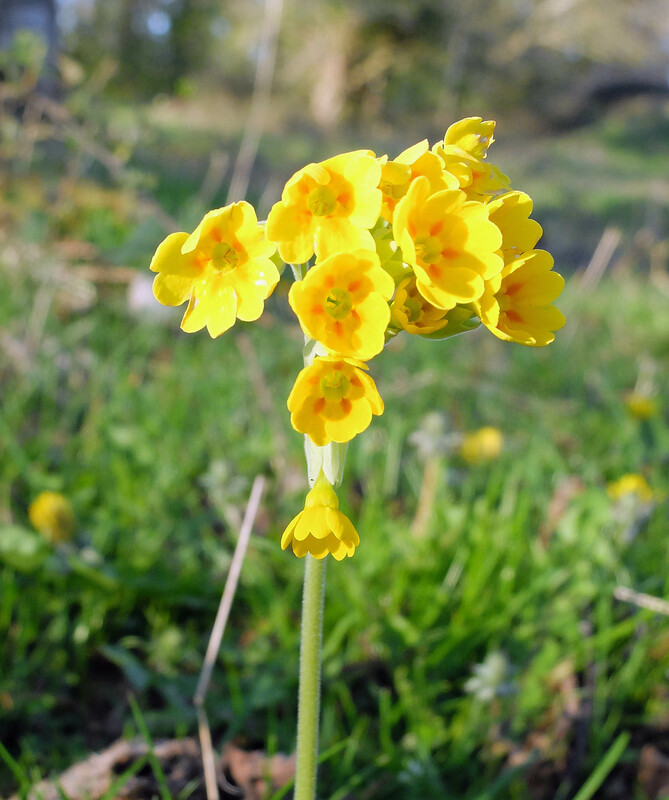 Cowslips have an amazing orange centre, smaller and more delicate flowers than the primrose. 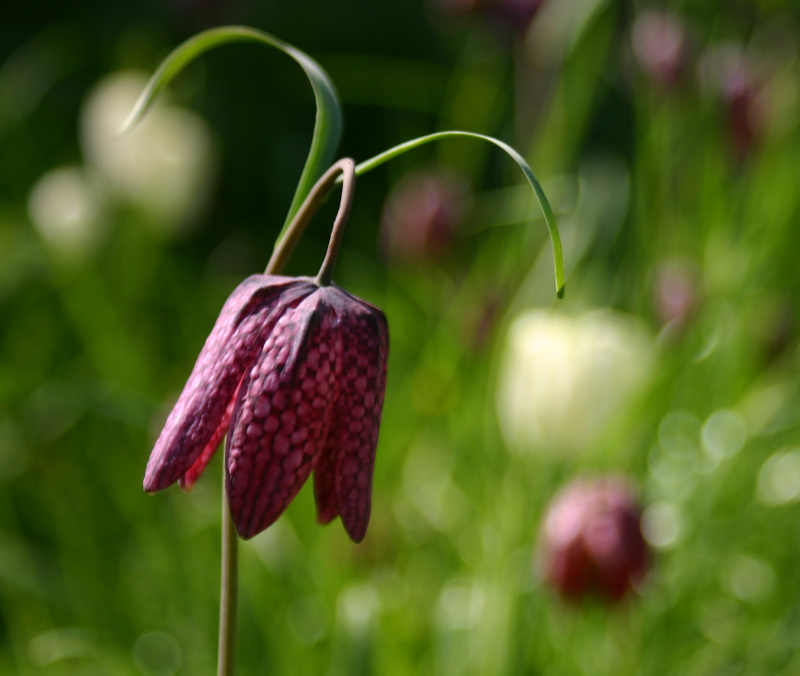 How do they all stand upright on so slender a stem? Nature in it’s simplicity offers such an abundance of pleasures for us to enjoy. 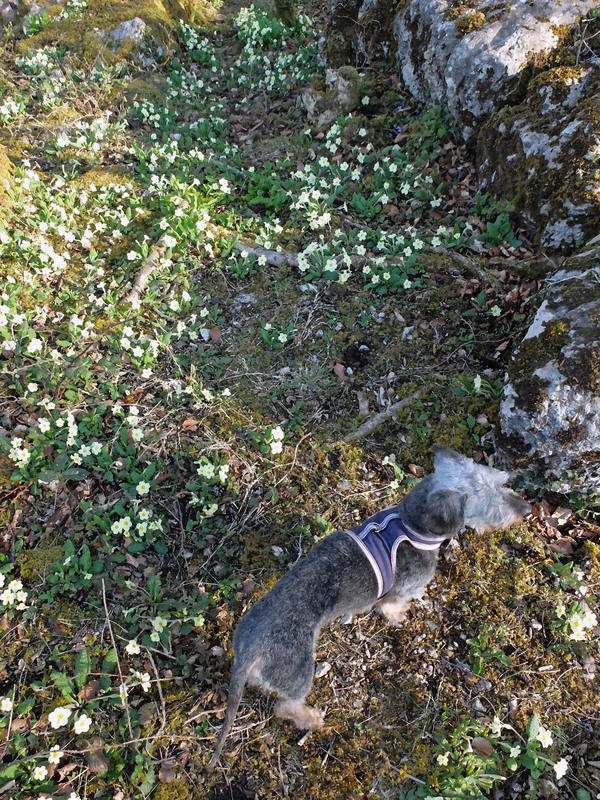 Tread quietly through the woods and keep a keen eye out for it’s treasures, and watch underfoot for the dog violets, celandines and speedwell, to pretty to go unnoticed. I have experimented with gluten-free bread for a while now and maybe it was the sunshine giving my hands magical powers because this week I got it right! There have been some disasters but this was lovely, the best I’ve made so far. It doesn’t keep so well so next time I will slice it and freeze it, then use when I need it. It’s particularly good toasted with homemade Damson Gin Jam….and lots of butter of course! 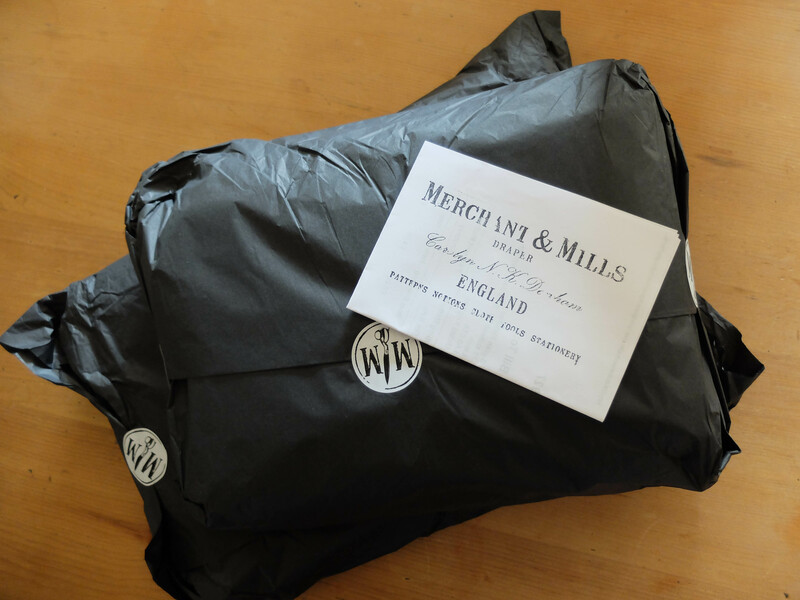 Also this week my fabric from http://merchantandmills.com/ has arrived and I am in heaven! Glorious wonderful fabric, exceeded my expectations and I can’t wait to get sewing, I will post when I make my first creation for summer. Beautifully packaged! Alfred has also been enjoying the sun this week. Lounging in the window soaking up the rays, it’s his favourite place in the house, apart from the fire of course! He always seems to know when I’m going to take his picture and often moves or shyes away. 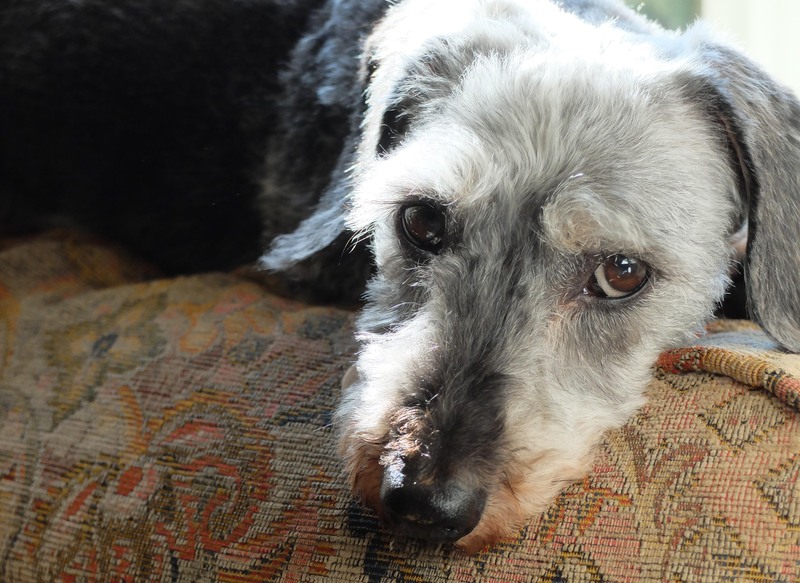 He’s looking smart with his new haircut, his coat is like a moles back and he gets all excited after his spring cut and bath! This is my first sketch of Alfred with his short hair, he’s like a different dog but not as smelly now! The beauty of dying roses, wonderful fabric and re-visiting my first dolls! 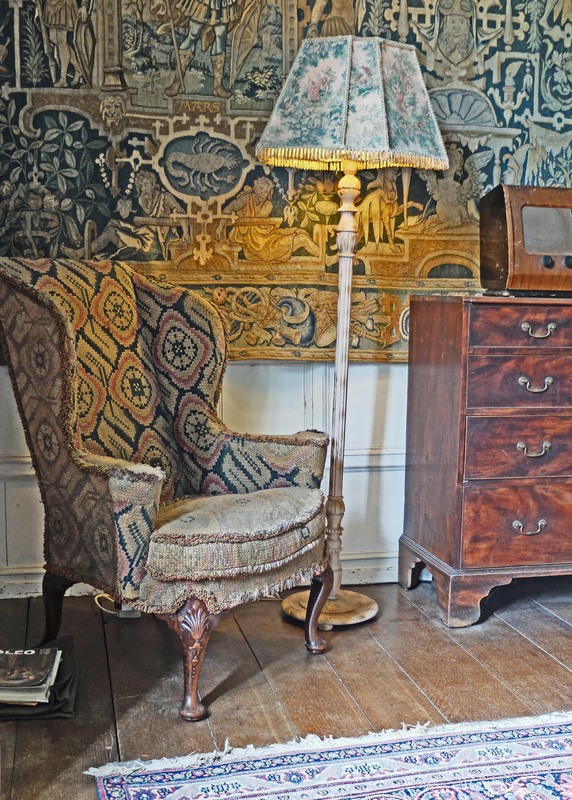 This week seems to be passing so quickly and it won’t be long before May is upon us, and with the suggestion of warmer weather I have ordered some fabric from a wonderful shop called Merchant & Mills based in Rye, Sussex. I await in anticipation on its arrival so I can sew my spring/summer wardrobe. 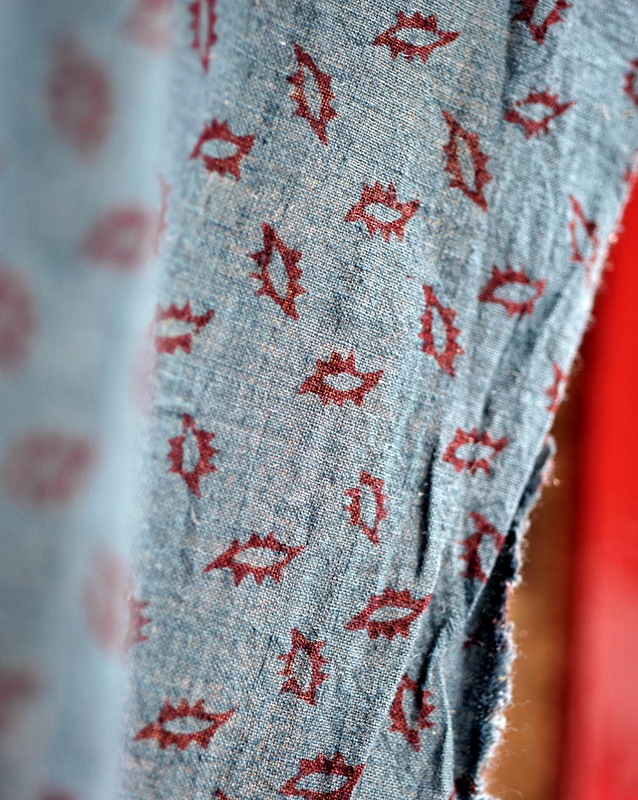 They sell the type of fabric I love, cottons, linens and wool, fabric with texture and a feel of naturalness. 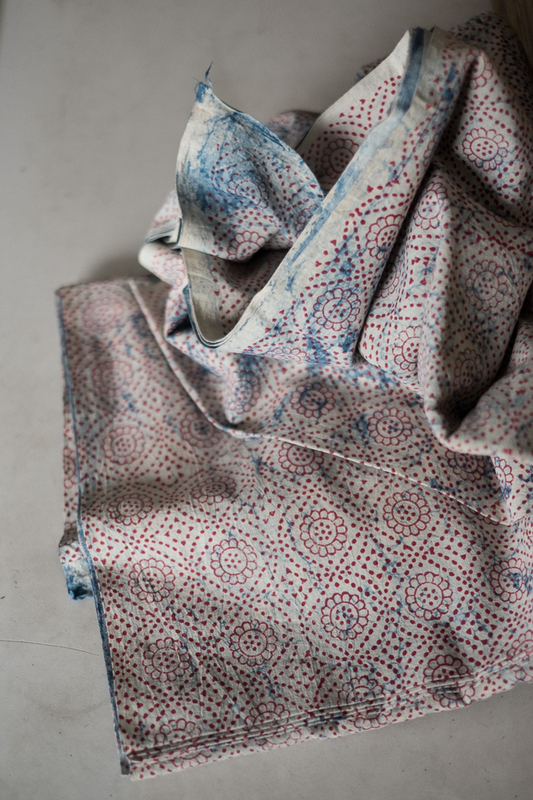 It’s getting difficult to find good dressmaking fabric these days but there is plenty for craft, patchwork, or furnishing fabric. So finding this gem of a shop has filled me with a joy I can’t describe! My machine is going to be red-hot in a few days! Alas, I have to wait a few days for the arrival of these scrumptuous fabrics so in the meantime I have been busy finishing a doll I have been working on. Paperclay is relatively new to me and I am still experimenting with it. 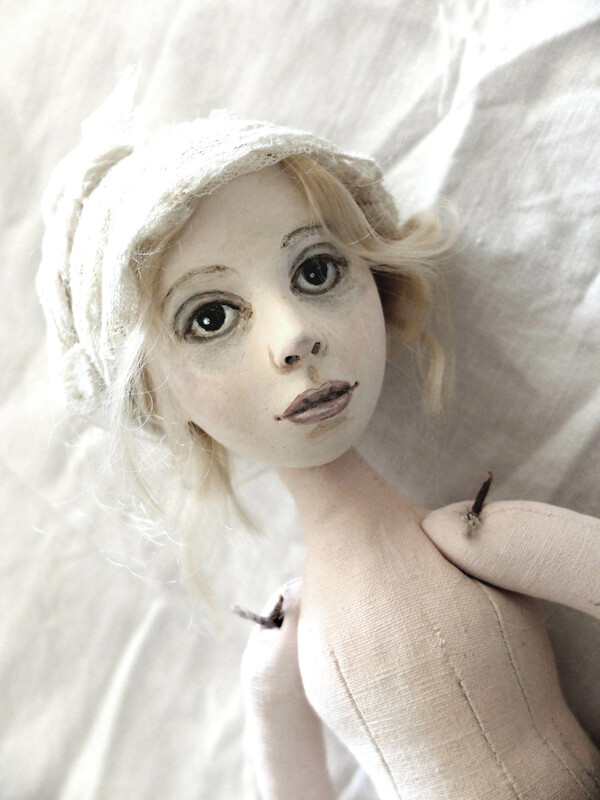 I have worked with polymer clay before to make dolls but stopped some years ago. I enjoyed making children from photographs, some of them commissions. The whole process was fun from beginning to end and my head would be busing during the whole process. I made everything myself, no moulds involved. The head, arms and legs were sculpted and joined together with a wire armature which was covered with batting, then a cloth skin sewn over it. The faces are painted with watercolour and then I make a mohair wig, which takes a while to decide which colour suits the personality that has emerged from the clay. 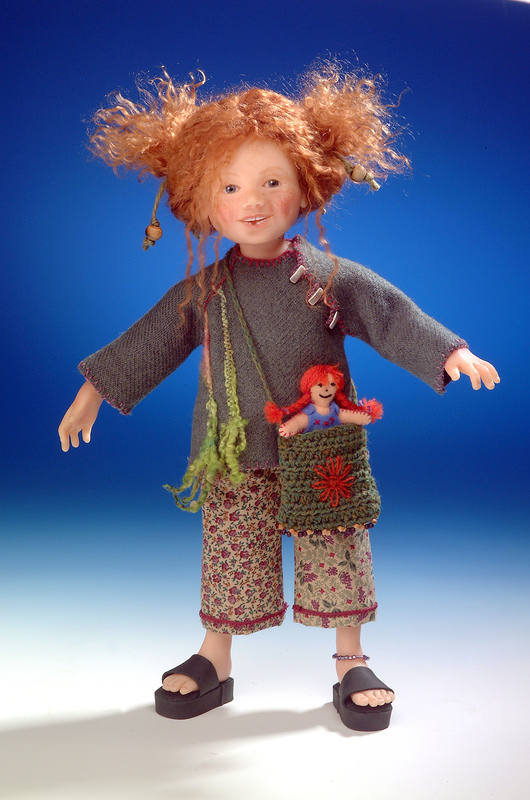 The most exciting part of doll making is developing the personality whilst choosing an outfit and accessorizing. I often make a bear or a doll, some shoes or a bag, what ever seems right for the character. I like to try to keep the scale of everything correct, even knitted or crocheted items and often split wool to make it fine enough. These two are Rachel and Masie. 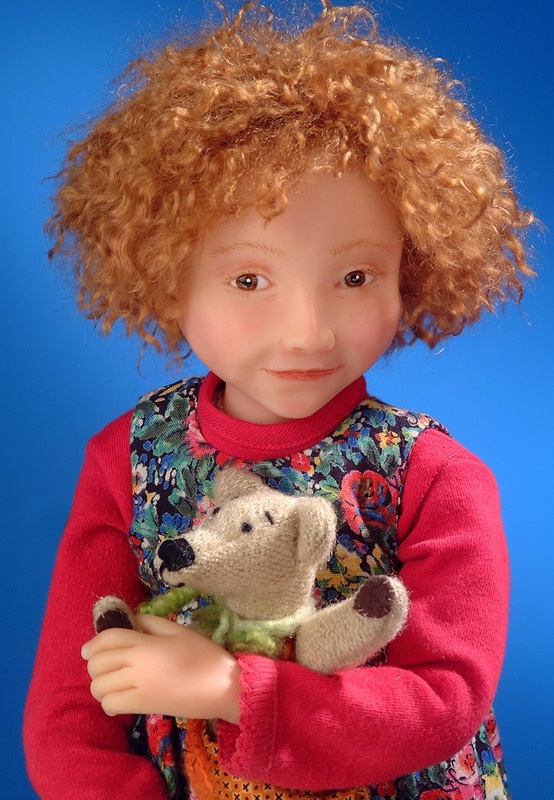 Rachel was one of twins I sculpted as a commission and Maise has a front tooth missing. 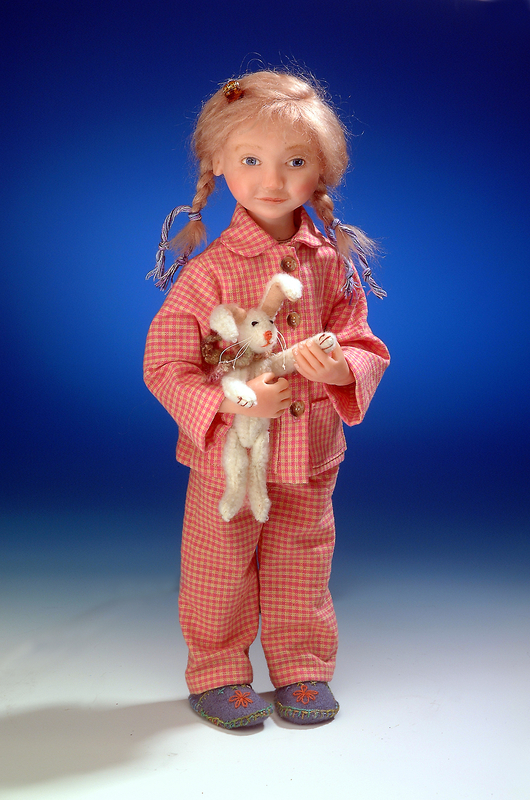 Lucy is ready for bed with her rabbit and felted embroidered slippers, I loved her pyjamas! 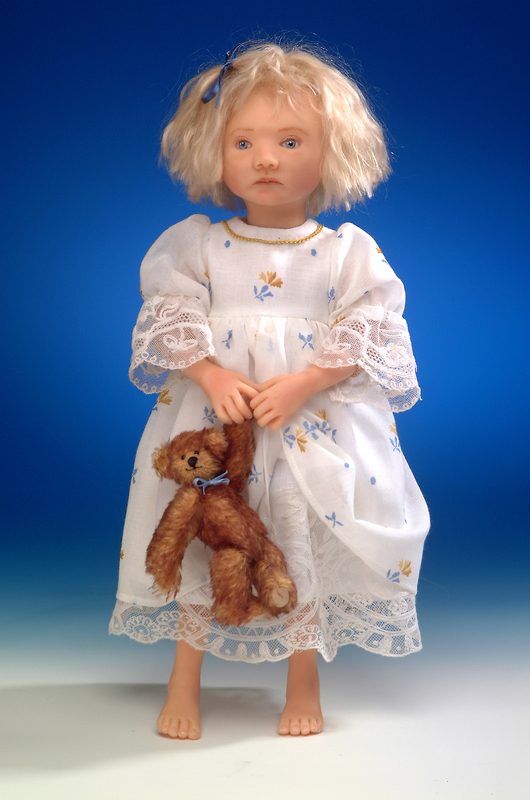 Charlotte is solemn in her pretty dress holding her bear. I later made her some felted shoes as requested by the lady who bought her. It seems a long time since I made these dolls and my new dolls are very different. 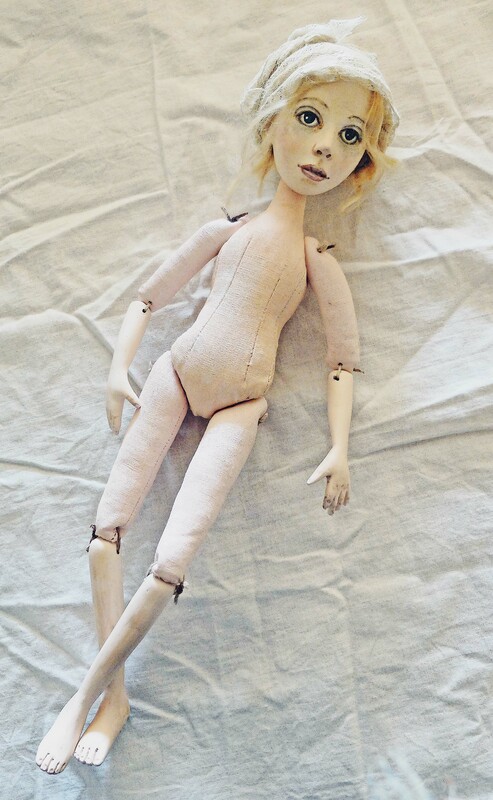 I may go back to more realistic dolls sometime, but for now I am enjoying experimenting with paperclay which brings out different ideas in me. I’ve been reminiscing so much I think I will leave my recent doll for my next post as it’s much later than I thought, but she’s very different from these ‘wee’ children! From the mist comes the sunshine! 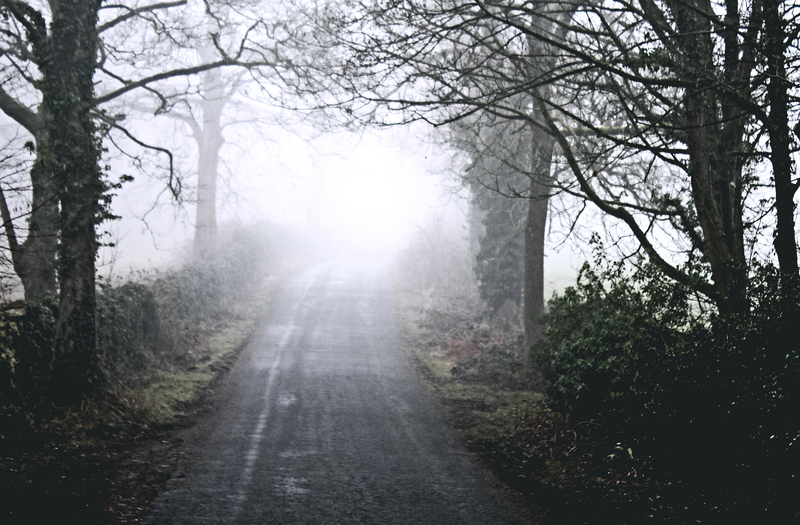 The Easter weekend is over and Silverdale is emerging from the mist! It seems we were one of the few places in the country shrouded in mist for the whole three days. But just four miles away in Arnside the sun was shining, but it didn’t stop the walkers arriving on mass. It has been like a scene from Brigadoon, an old movie I remember from childhood about a mysterious Village which appears from the mist once every hundred years and is discovered by Gene Kelly, who falls in love with a local, great stuff except for the singing. Must have looked a little like this – except for the water of course, just use your imagination. This is an island across from Arnside looking suitably creepy in the morning mist over the weekend. I love the way the weather doesn’t seem to bother the British, they get out there whatever the weather! We had a lovely walk from Arnside along the shore and back to Silverdale, calling for coffee and cake at the Bobbin Cafe on the way. It must be one of the best views in the country to sit and enjoy whilst eating cake! Admittedly the view was a little obscured by the weather, but still very beautiful. When the horizon disappears it looks like the edge of the worlds has melted away, no difference between earth and sky. Alfred enjoying his walk and a bit of cake of course! All these pictures look cold but it wasn’t, just damp. 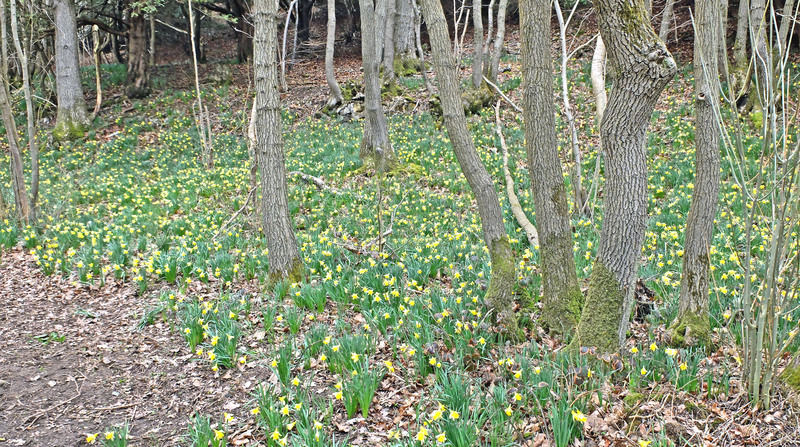 The sun did shine whilst we sat outside with our coffee, but we continued on through the woods, which were full of daffodils and wood anemones. Thankfully the mist has gone now and this morning sunshine welcomed us for the day. I love the mist but it’s nice to feel the sun on your face and view the world with a warm glow, spring in full bloom and people smiling, long may it continue! Easter, cards, paintings and cake! The Easter break has started as it often does with a slow constant drizzle. It’s mild but damp and people occasionally walk past the window carrying big umbrellas and kitted out in waterproofs and rucksacks. We live in an area which is very popular with walkers and on days like today I feel a bit sorry for them whilst I’m inside in the warmth. Alfred is curled up in his blanket and I’m here writing. There is a play on radio 4 which suits the weather well, a dull story of admission set in Yorkshire. I always find radio plays more poignant than television, allows your imagination to picture the visuals to match the words. But since it’s Easter and rabbits always appear this time of year I thought I would show you a picture I did for a friend who asked me for an Easter card. 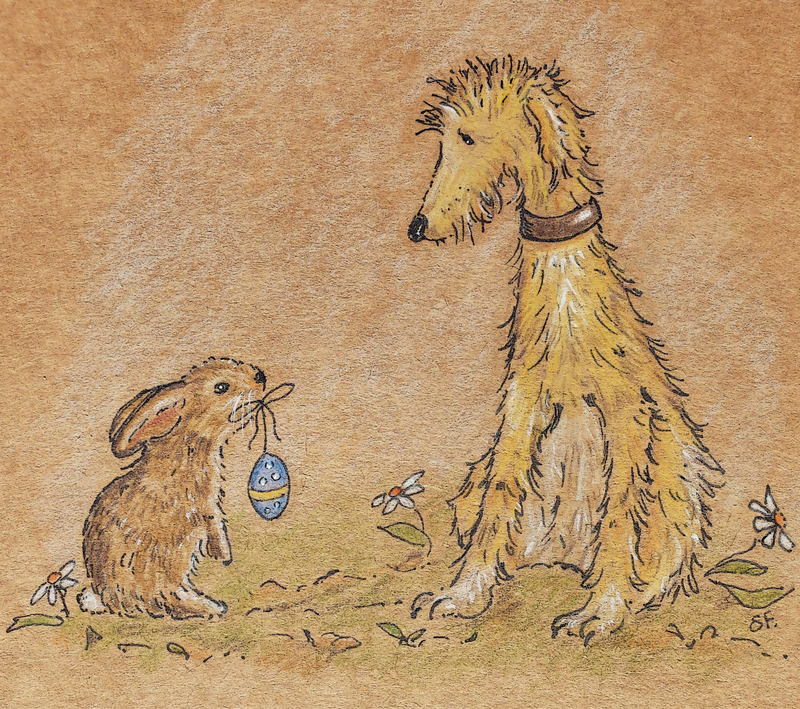 I decided to draw their dog called Fern looking at a rabbit offering her an easter egg. I know this is fantasy as Fern being a lurcher would not be sitting looking kindly at the rabbit, but this is art and you can do what ever you want! It’s a simple sketch in pencil crayon and ink on brown paper and it worked well on a card. And Fern really is that cute! Keeping with the rabbit theme, a couple of years ago our daughter went to work in Dubai for a year and had her birthday there, so I set about making her a present. 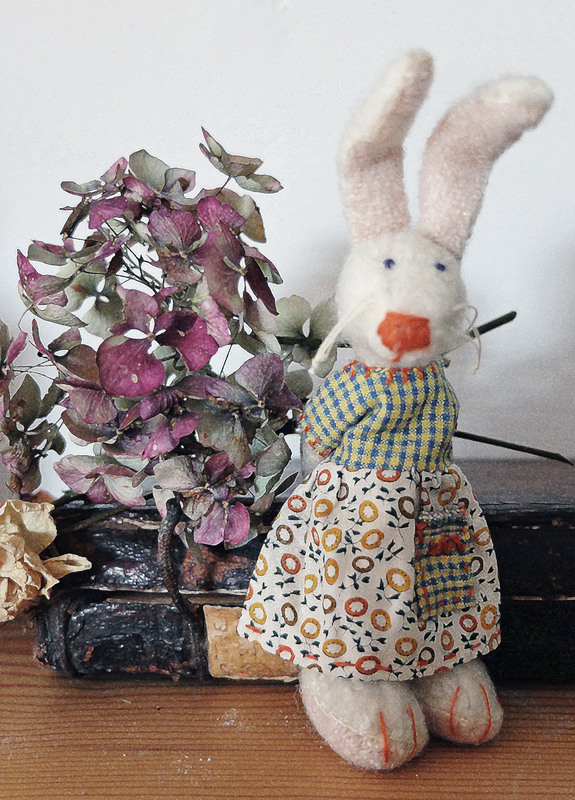 She has always loved rabbits, so I made her one with 3 little outfits, a day dress, a nightdress and a ballet dress, which I wrapped individually in tissue. She’s called Verity and is only 4″ tall. Verity went everywhere with Sophie, even to work in her bag! 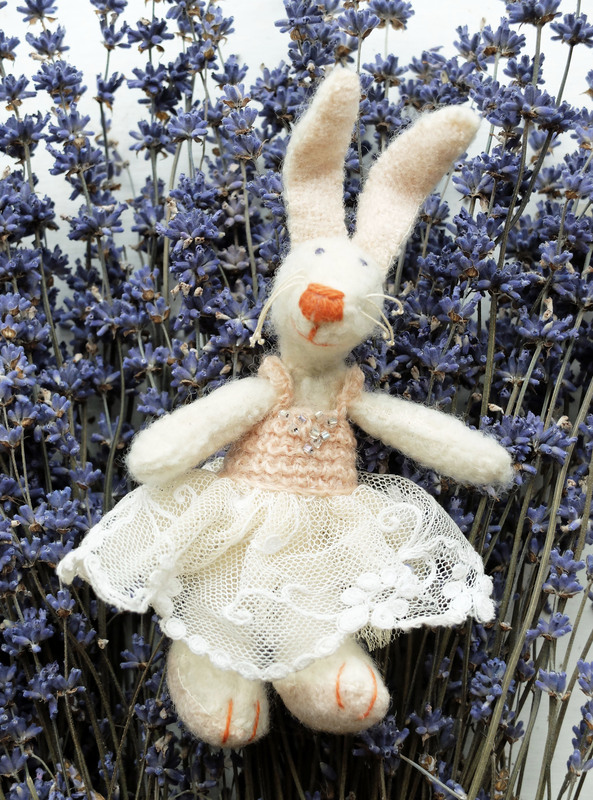 Verity in her Ballet dress, her whiskers are bits of string with knots on the end and the dress bodice is crocheted. Sophie was pleased with Verity and still treasures her. But thankfully she’s back home, I missed her too much! 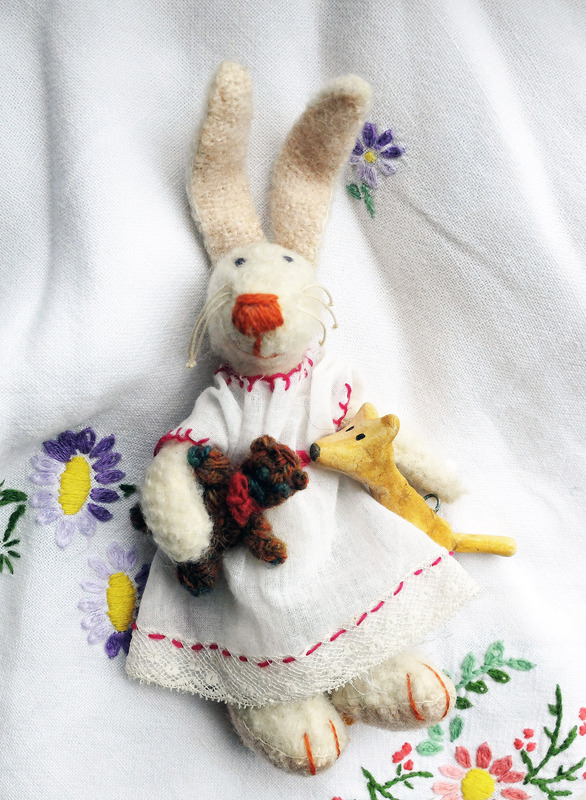 Rabbits often seem to come up, whether there in drawings, paintings or one’s I make to accompany my dolls or ones just to cuddle. 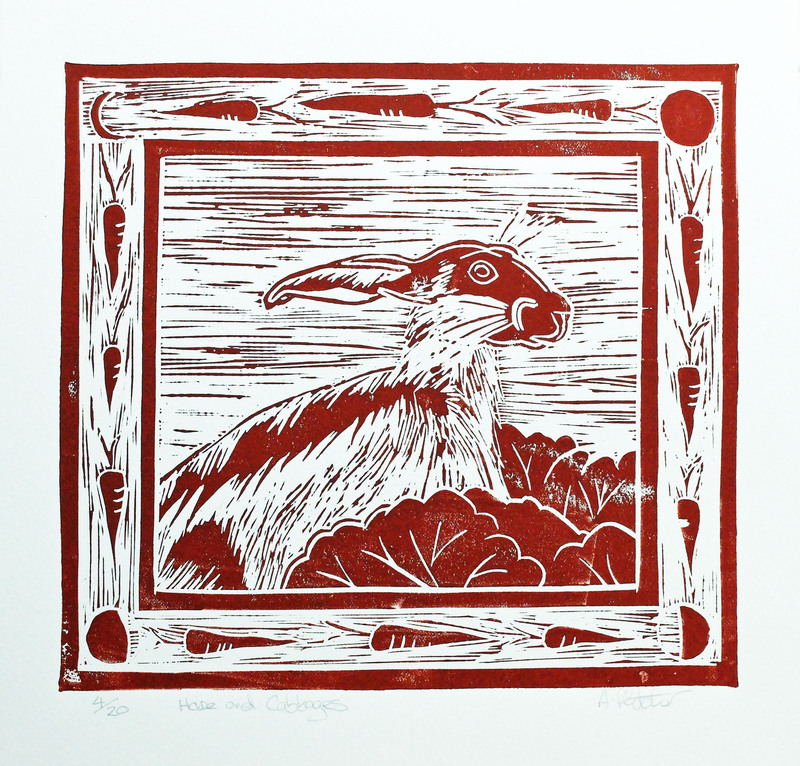 This is a linocut my husband did, his first try, I rather like it! He did a pair, but the other one is of doves and I love them both. Lino cutting isn’t something I have had much success with, I would prefer to paint or work in 3 D. But I hope he does some more, as it’s not easy and I think he could really develop his own style quite quickly. 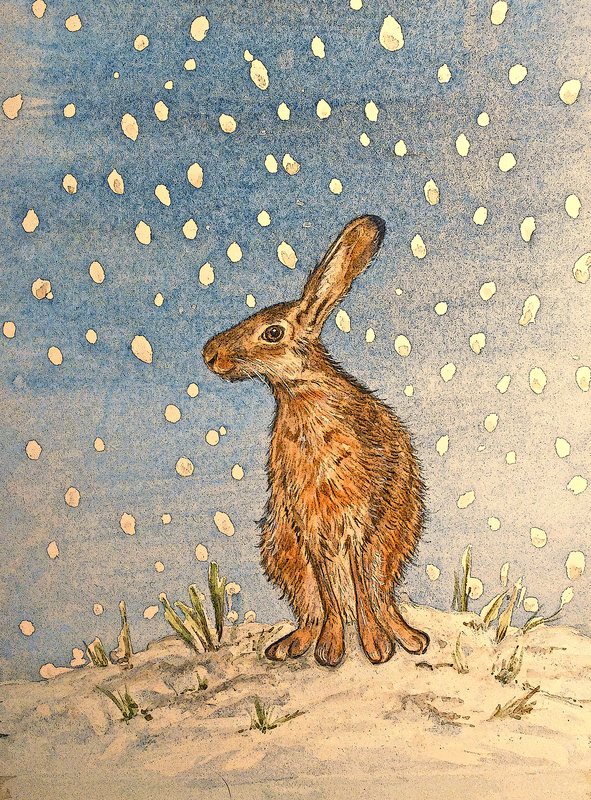 This year I did our Christmas card of a hare in the snow in watercolour, they keep popping up don’t they! Changing the subject a bit, although I’m sure there will be plenty of eating going on over the Easter break, especially chocolate and cake! Yesterday I visited a friend for coffee and took some cake with me. I must say, I was pleased with the way it turned out. It was moist and brimming with flavours and thankfully my friend thought so too. Very easy to make and if you don’t like orange, change it for lemons or even lime, just make sure you think about equivalent quantities to 2 oranges. It’s gluten-free and fat-free, but you can’t tell. Scrub the oranges, put them whole in a saucepan with enough water to cover, put the lid on. Simmer for about 2 hrs until tender. Change the water a couple of times to get rid of bitterness during simmering. Brush the cake tin with a little melted butter. Line the bottom and sides with parchment paper. Halve the oranges, remove pips and puree the flesh and peel in a blender. Beat the eggs and sugar till pale and light and soft. Combine the baking powder with the ground almonds then fold gently int the eggs. Fold in the oranges. Pour the mixture into the prepared tin and bake in the centre of the oven for about an 1 hour. I put a double layer of parchment gently over the top when I place it in the oven as it browns before it cooks otherwise. If after about 45 min it’s brown enough turn your oven down and cook for 10-15 min longer. Check with a skewer inserted in the centre, it should come out clean. But this is a very moist cake and sometimes difficult to tell. Cool on a wire rack and gently remove paper. To make the topping mix the sugar with the mascapone, lime rind and juice. Go carefully with the lime juice if you want to spread the topping on the top of the cake, but add it all for a cream consistency. I hope you enjoy it, and HAPPY EASTER!